Gold mines with the excavation of traces of silver and copper and just for good measure, the processing of aluminum. A metallurgists dream and a railroad parallel directly from the annals of the Old West in North Carolina. The Tar Heel State one might ask? Indeed so. Added to this the excavation of granite and sprinkle in the more indigenous textiles, brick making, and agricultural products. Stir it up and one will discover a created concoction that is the Yadkin Railroad and alternating Southern Railway branch line that originally ran from Salisbury to Norwood. 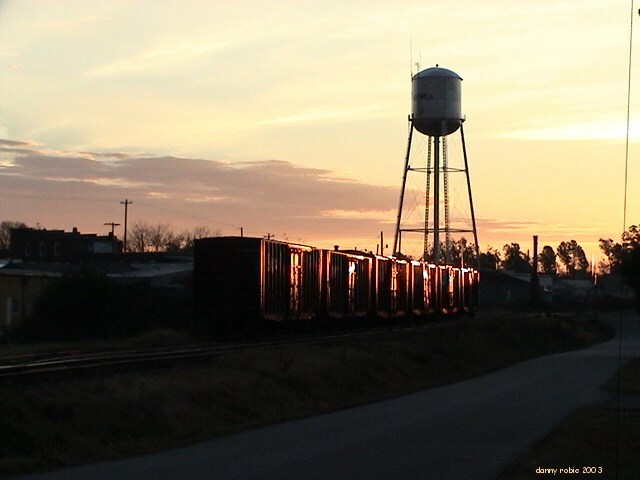 Geographically defined by the rolling hills and pastoral settings of the Piedmont, the Yadkin line originates at the railroad hub of Salisbury and meanders south touching small towns with colorful histories such Rockwell, Granite Quarry, and Gold Hill. 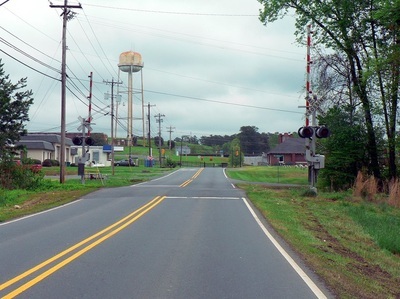 Once into Stanly County, the line traverses the communities of Misenheimer and New London before splitting at Halls Ferry with the main stem once continuing to Albemarle and beyond to Norwood. 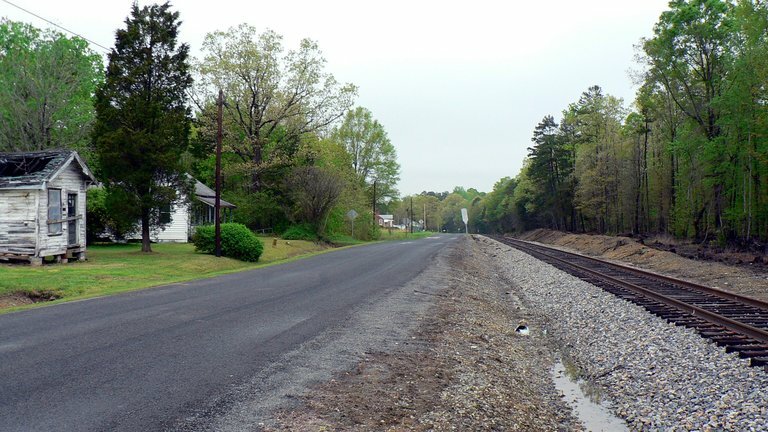 The diverging route passes through Whitney and terminates at the town of Badin and although operated by the Yadkin Railroad and later Southern Railway, this 11 mile section was leased from Alcoa Aluminum. The Winston Salem Southbound Railway also utilized trackage rights between Whitney and Badin as well. 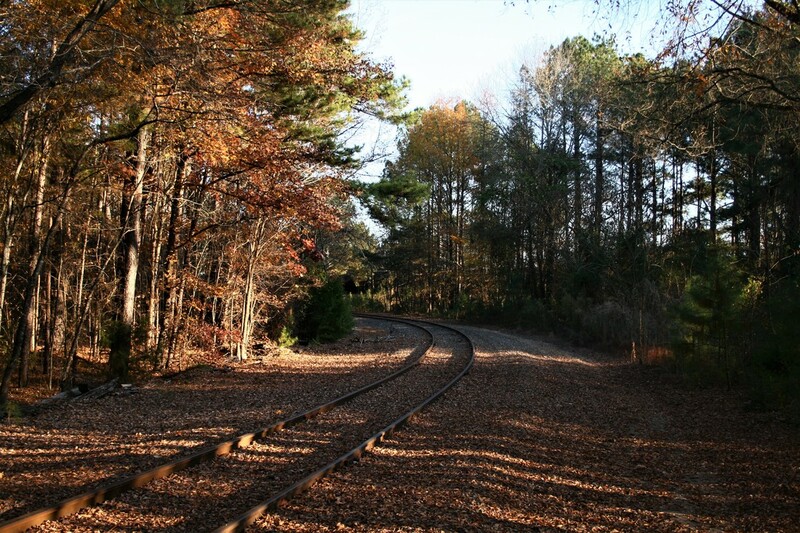 The topography of the railroad was not unlike other routes in the North Carolina Piedmont. An up and down profile with small gradients and descents as it traversed the countryside, the variations in elevation ranged from 820 feet above sea level at Granite Quarry to 407 feet at Norwood as originally built. As it moved further south, the elevation decreased as it approached the coastal plain. 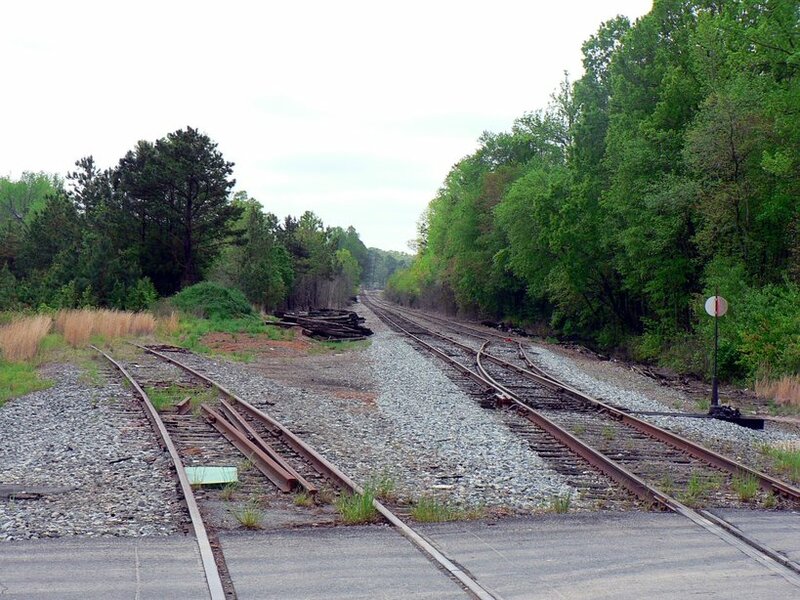 This branch line shared territory with two other railroads in the region, the Winston Salem Southbound (WSSB) and the original Norfolk Southern Railway. 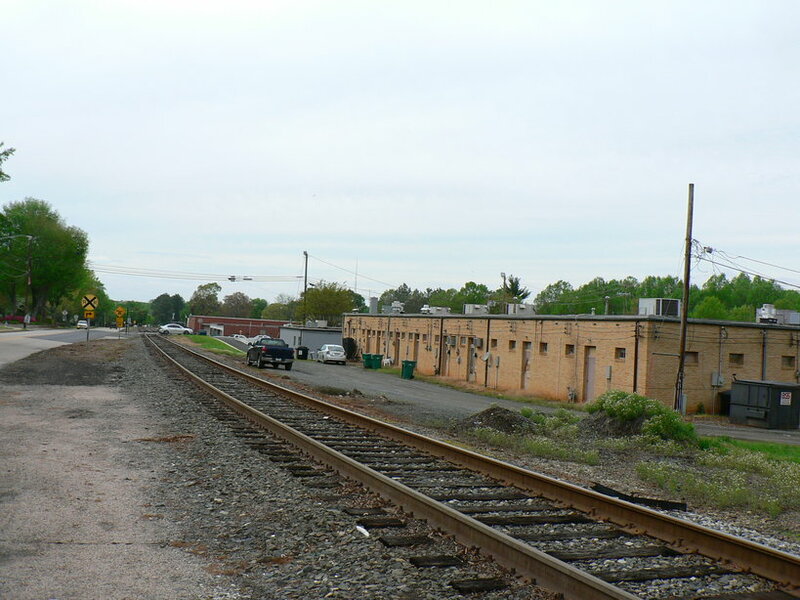 The WSSB was intersected at Albemarle and paralleled it to the terminus at Norwood adjacent to the original Norfolk Southern Railway (the Aberdeen, Carolina and Western today). Operationally, the leased section from Halls Ferry to Badin also intersected the WSSB at Whitney. The passing of time and the disappearance of industry has shortened the active portion of the line. Long gone is the section of railroad from Albemarle to Norwood having been abandoned during the later Great Depression era. The early 21st century witnessed the closing of the Alcoa Aluminum plant that effectively ended service on the Whitney and Badin sector. 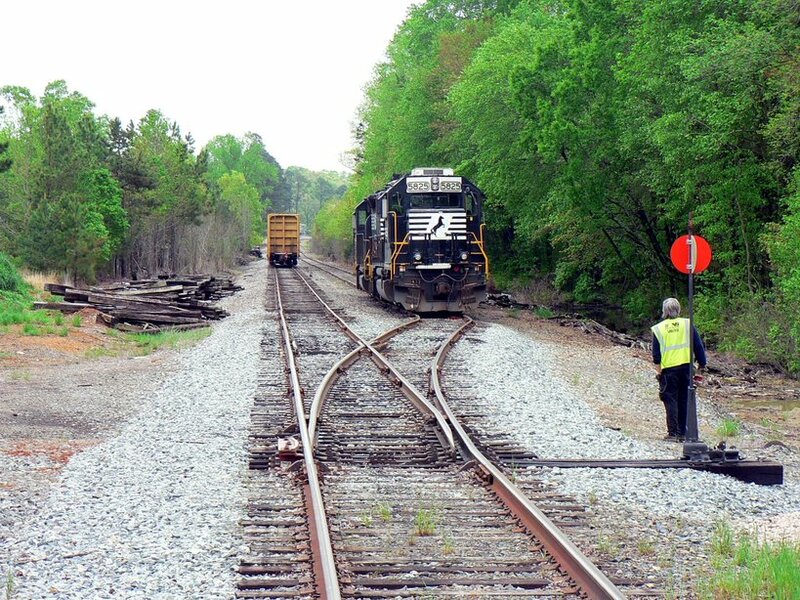 Finally, all rail service along the railroad in Albemarle dissipated leaving the junction at Halls Ferry as the end of the remaining active portion. No serious upgrades have been implemented on the Yadkin line---known as the NS "N" line---- although there were plans to during the early 2000s but the shut shutdown of ALCOA ended these. The route is dark--without signals--and remains as jointed rail with only short stretches of welded rail throughout its course. Movements are governed by track authority by differing NS dispatchers depending on the time and day of week. Track speeds vary from 25 MPH to a crawling 10 MPH subject to track condition and location along the route. Operation along the route is contingent on volume of work on any given day and although a relatively short distance (26 miles), it is not uncommon for the train crew to law out before returning to the old Spencer yard. The Yadkin line is a vestige of a bygone era in terms overall scope--the slow speed, communities along the route, and the atmosphere. One could easily forget that a Class 1 railroad still operates on this branch line because it is more representative of an independent short line. 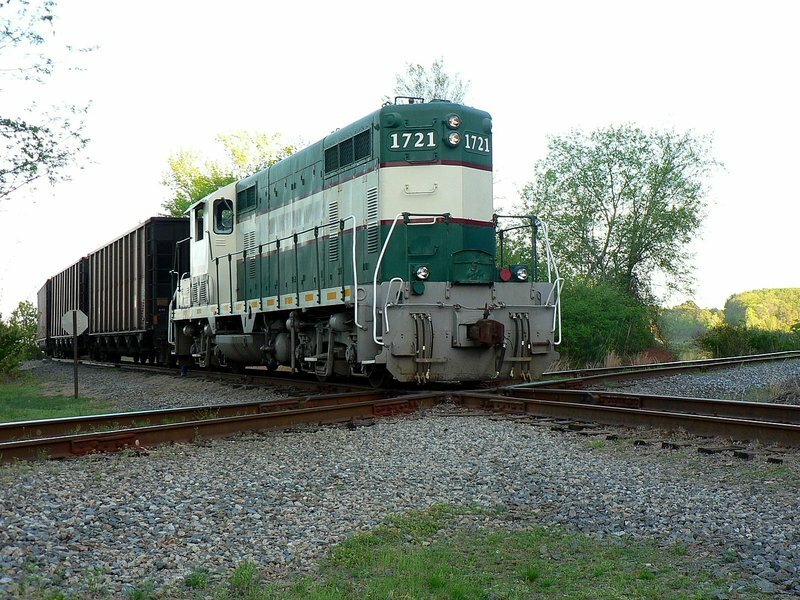 Originally conceived in the Reconstruction Era of 1871, the Yadkin Railroad proposed construction was from Salisbury through Albemarle with its terminus at Wadesboro. Despite the issuing of the original charter, the building of the railroad did not materialize for another two decades. It was not until the Richmond & Danville Railroad, itself as the operator of the North Carolina Railroad which not coincidentally, served Salisbury, purchased the stock of the Yadkin Railroad. In 1890, construction finally commenced and the railroad was completed between Salisbury and Norwood in 1891. Not uncommon during the great railroad expansion era, routes often ended before reaching the originally planned destination. In this case, the railroad was not constructed from Norwood to Wadesboro as originally intended. In 1894, the Richmond and Danville Railroad was sold and ultimately became the core of the Southern Railway by 1897. 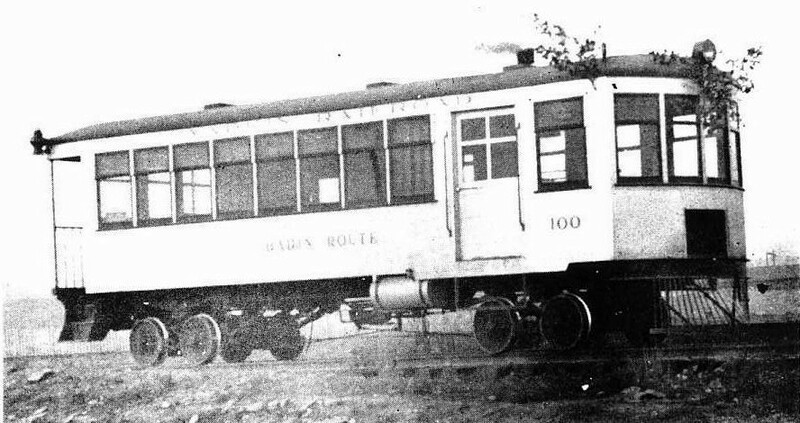 The Yadkin Railroad, in turn, became a subsidiary of the Southern and in spite of mounting losses, continued to operate as such until the parent road released ownership in 1916. 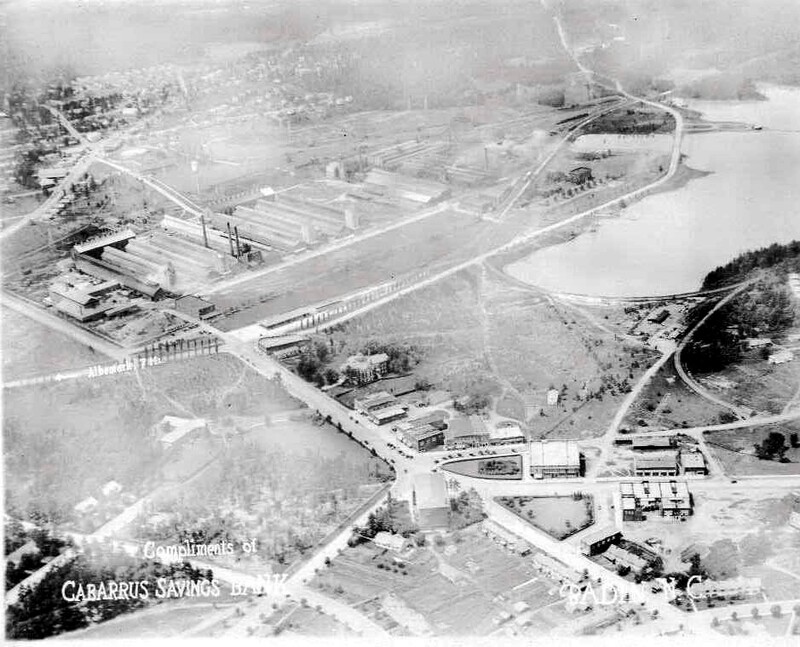 It is ironic to note that at this date the construction of the aluminum plant at Badin was in progress which would add significant carloads for the Southern. Obviously, losses originating from other facets of operation did not influence the road to retain ownership in spite of the new development. 1925 Southern Railway passenger timetable for trains to and from Norwood and Badin. 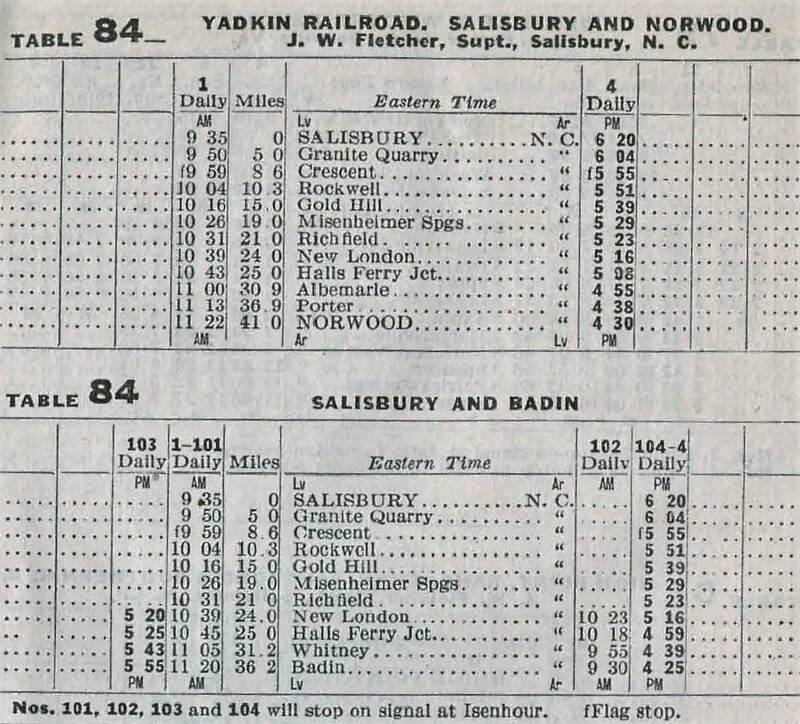 By this date, only one train remained between Salisbury and Norwood. Three years later the service would be abolished altogether. Significant decline became apparent with the closings of the two largest and longtime shippers on the route, Alcoa Aluminum at Badin and Wiscassett Mills in Albemarle. 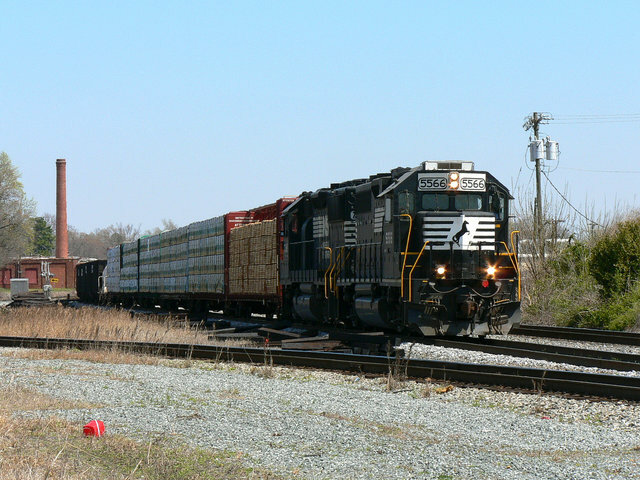 Reductions in the number of shippers have in effect transformed Halls Ferry as the end of the line in current day Norfolk Southern operations. 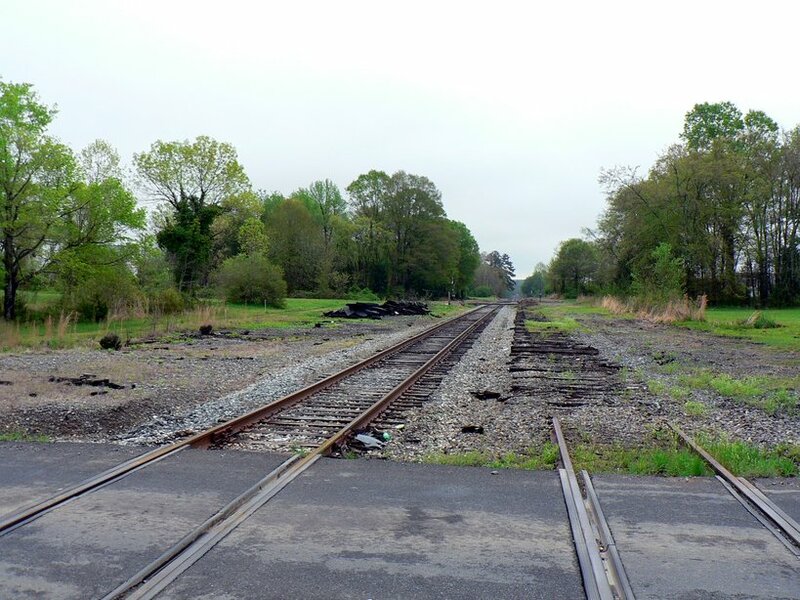 The track is either removed or out of service from Halls Ferry into the city of Albemarle and the track from Halls Ferry to Whitney is extant but also out of service. Until the closing of ALCOA, NS based a local in Badin designated as P91 that operated as a partial counterpart to P92 and in conjunction with it. 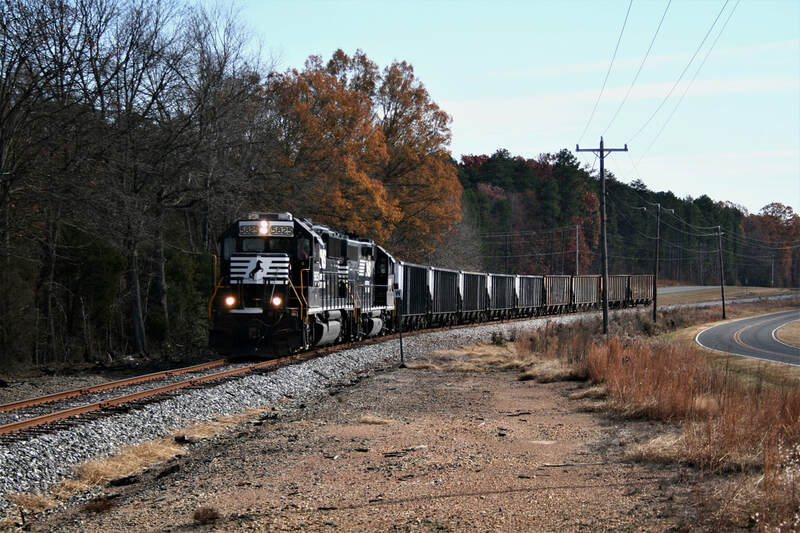 Today, Norfolk Southern still operates a weekday train (NS P92) from Salisbury to Halls Ferry serving several shippers along the route. Most of these of these customers are relatively young in age compared to the long standing shippers that once existed. It is also interesting to note that although the Yadkin Railroad is long vanished from the scene operationally, it still exists on paper within the holdings of the Norfolk Southern. 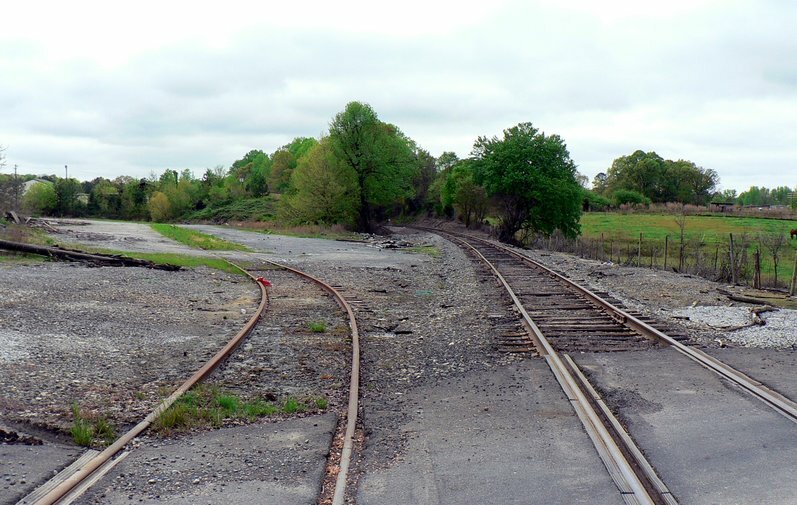 The present day connection for the Yadkin Railroad to the Norfolk Southern mainline--in actuality, the North Carolina Railroad----is modified from its original location. Originally, the line paralleled the main for short distance north to the present day Military Street overpass where it physically connected. 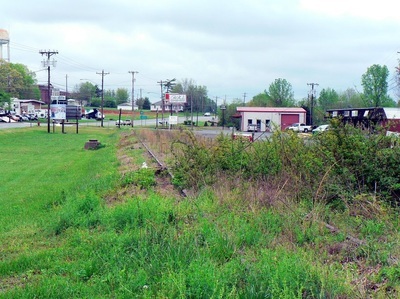 Immediately south of this connection that for many years was a spur running across South Railroad Street to Cone Mills. 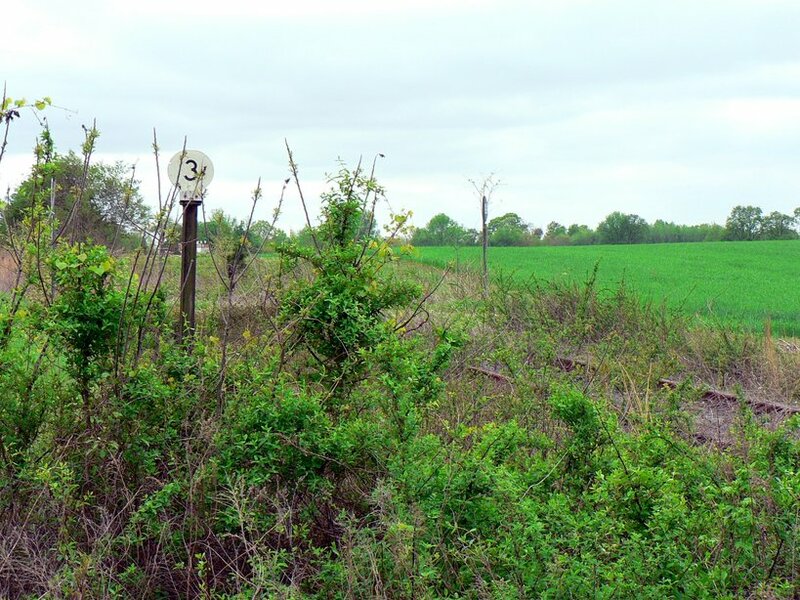 The relocation of the Yadkin Railroad connection technically altered the actual mile post locations moving south. The physical change was from MP 0 to MP 1, though, reducing the distance between the two to less than a mile. Apparently, this change was considered minor as no other mile post markers were relocated as a result. Yadkin Junction was obviously configured with the facilities at Salisbury and Spencer as originating or terminating points. Passengers departed from the Salisbury station running south for approximately a mile then easily diverged on to the Yadkin line. Inbound passengers from Albemarle or Norwood could disembark at Salisbury for connecting trains to the north or south. The pattern was likewise for freight and the yard facilities at Spencer to the north of Salisbury. 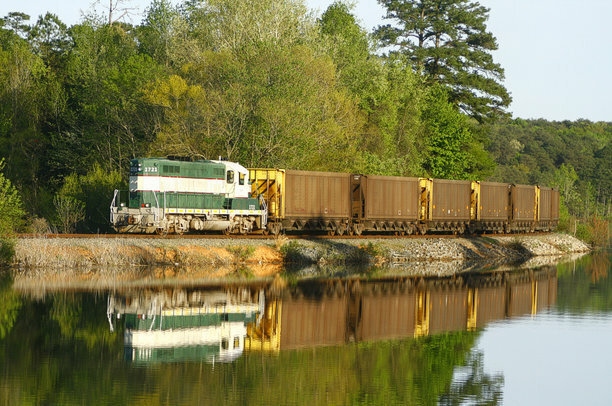 The numerous shippers located along the Yadkin line past and present begins less than a mile from the junction at Salisbury. 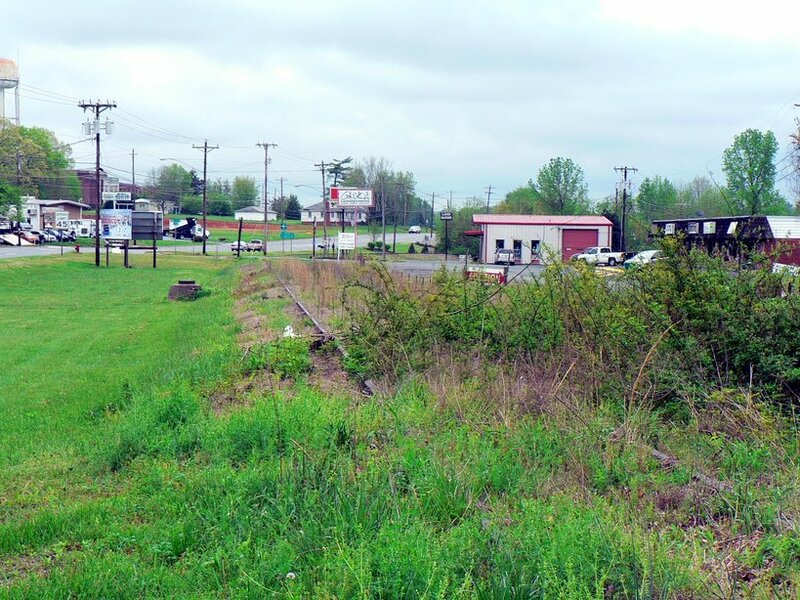 An old brick yard, ironically once located on Lumber Street, was located near Mile Post 1 but now only a rusted siding remains. Another former shipper is located beside the Martin Luther King Drive grade crossing. The siding is still intact but no longer in use. For years, a 50 foot Southern Railway boxcar was stored on it. 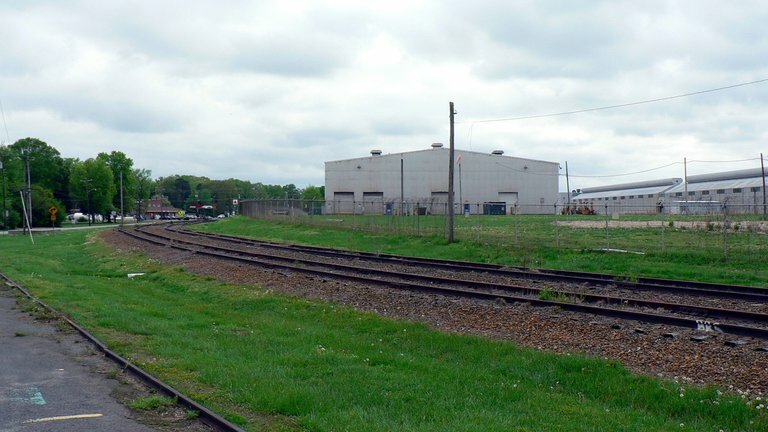 Another former shipper is located adjacent to the Jake Alexander Boulevard grade crossing but no longer receives rail cars. 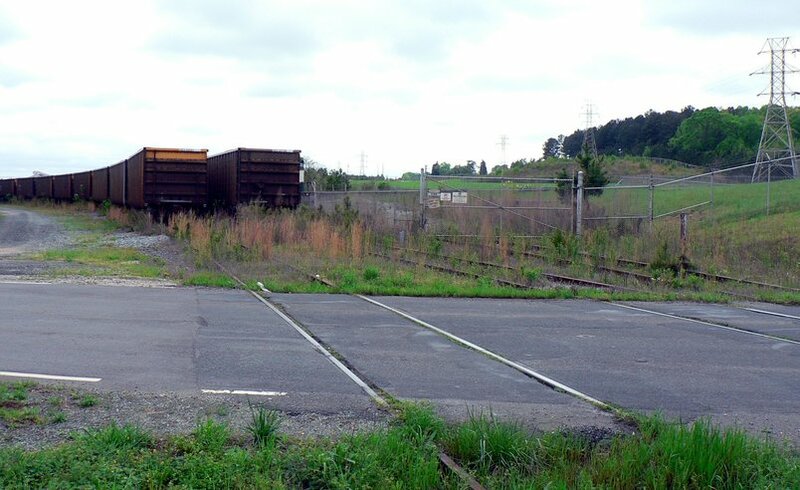 Two sidings once ran into the plant but one has since been removed. 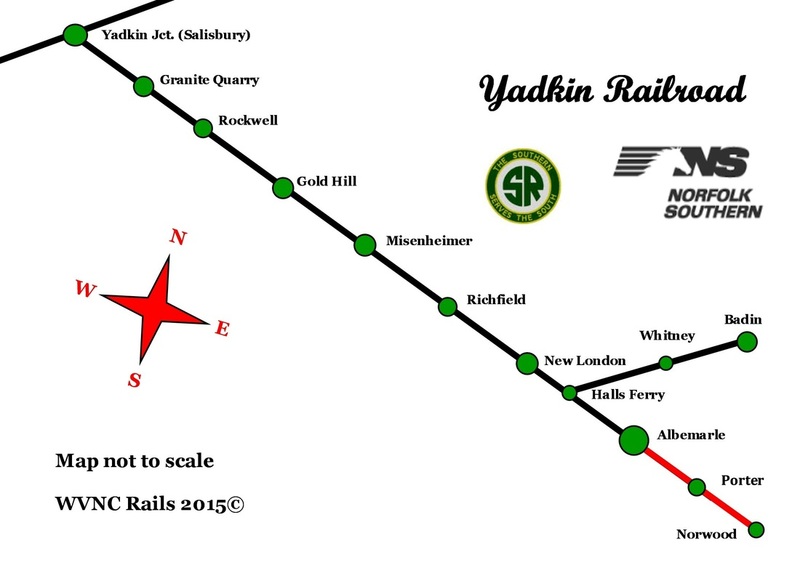 There are no remaining active shippers left on the Yadkin line within the Salisbury limits. 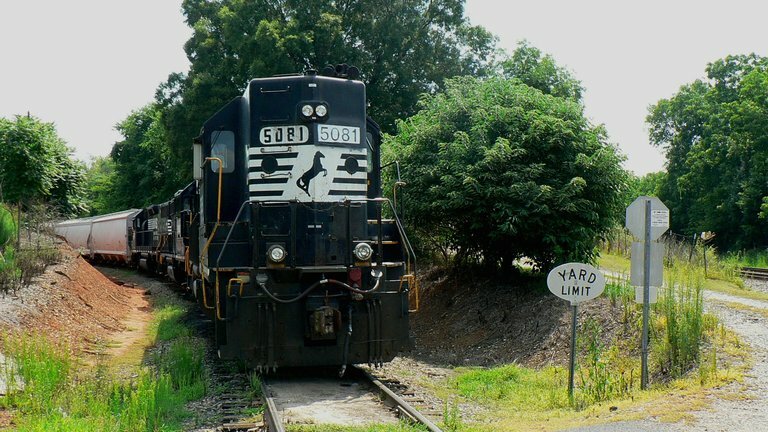 The first community moving south along the Yadkin Railroad is enriched with a unique history in its own right. 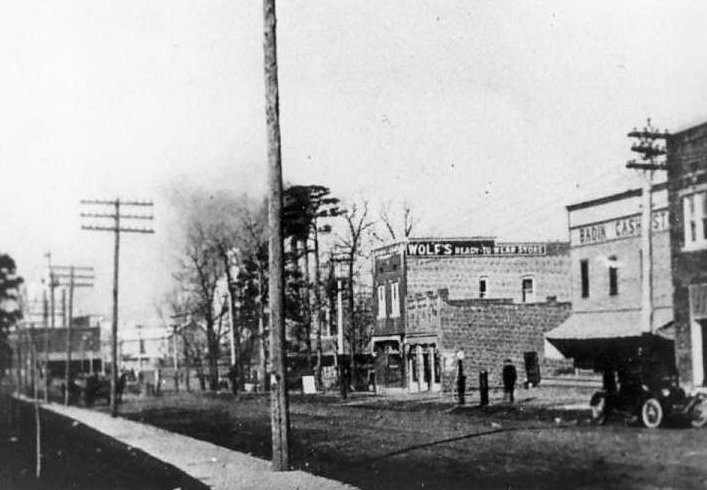 Founded as Woodville in the late 1800s, the name was officially changed to Woodsides by the turn of the century by the State of North Carolina. It was soon discovered that the name caused confusion with mail and freight as the name replicated another community in North Carolina. The solution was to again change the name and in 1902 the post office adopted Granite Quarry as the choice. It was approved by the North Carolina Legislature as the official town name in 1905. NS P92 runs southbound through Granite Quarry with a mixed consist. Two four axle units such as GP38-2 #5110 in the lead are common fare on this branch line railroad. Image courtesy Matt Robie 2014. Granite deposits were already known and cut but it was not until 1906 that large scale quarrying began. 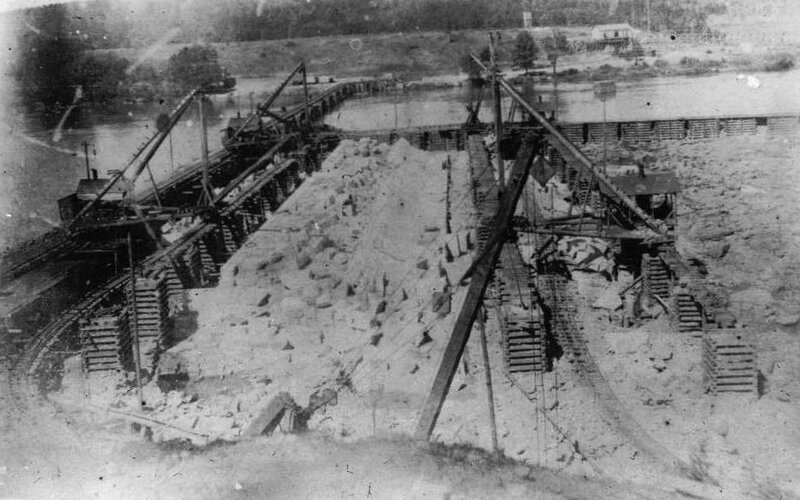 The construction of a dam on the Yadkin River by the Whitney Company required tremendous amounts of granite for the construction. A need for two separate operations required that two separate operations were necessary for the construction of the dam. Whitney was the primary company but it selected the Gillespie Company to oversee the mining of the granite at the quarries. The labor force consisted predominately of Italian laborers and English stone cutters. 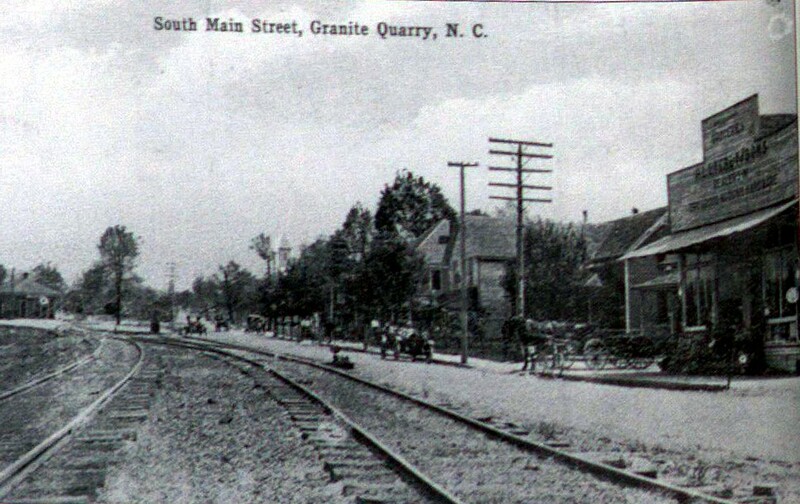 Northbound view through Granite Quarry circa 1910. 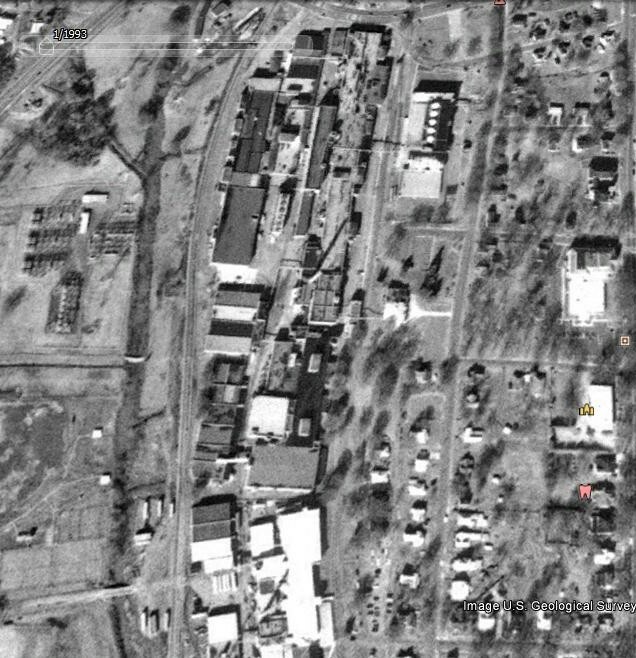 This scene reveals the orientation of the depot and its relation to South Main Street. Note the two sidings with the one in the distance occupied with cars. Postcard image courtesy Rowan Public Library. 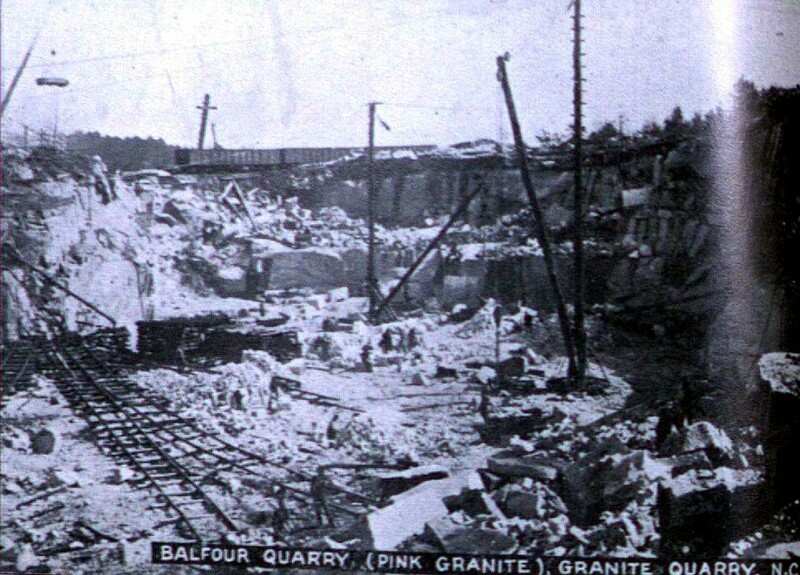 As the economic lifeblood of Granite Quarry was directly related to the mining, it was dependent on the continued demand for the stone that dam construction was providing. 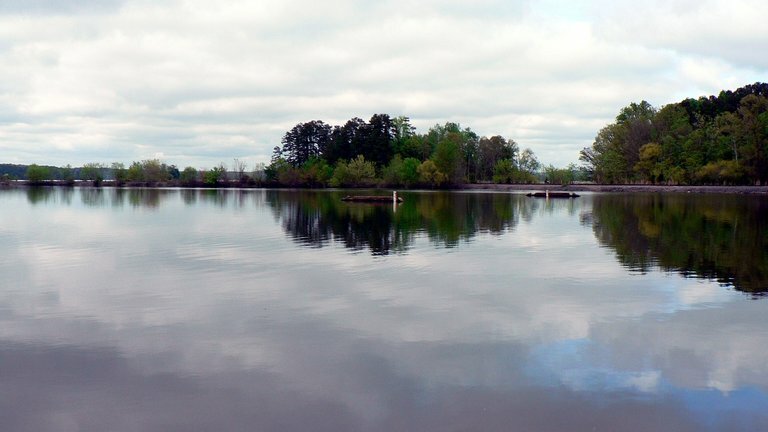 When the Whitney Company went into bankruptcy due to excessive costs building the dam on the Yadkin River, it also facilitated the cessation of operation by the Gillespie Company at the quarries. 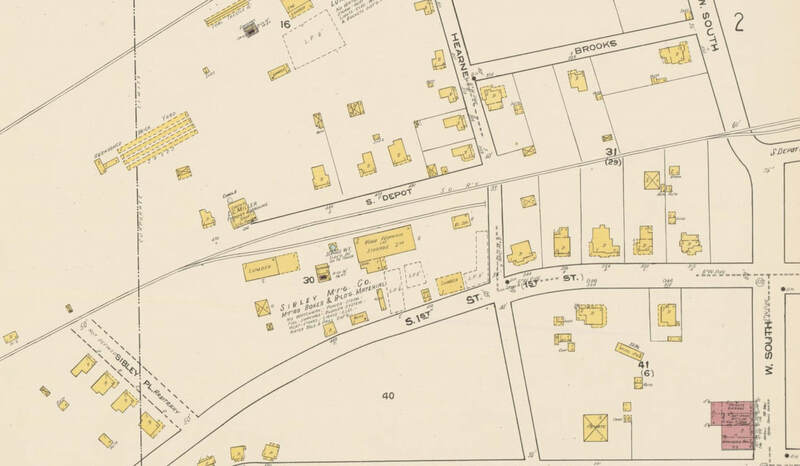 With the loss of business, Granite Quarry virtually disappeared from the map. 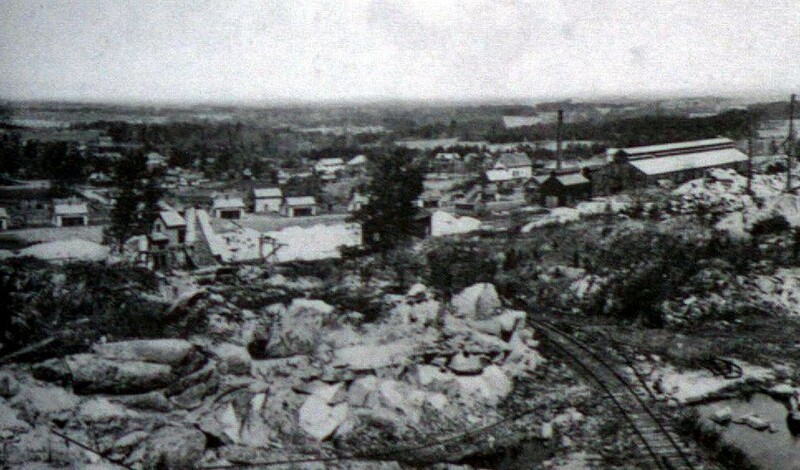 Early 1900s view of the heart of Granite Quarry adjacent to the railroad during the era of granite mining. This view looks south and in the curve at left is the depot. Image courtesy Rowan County Public Library. 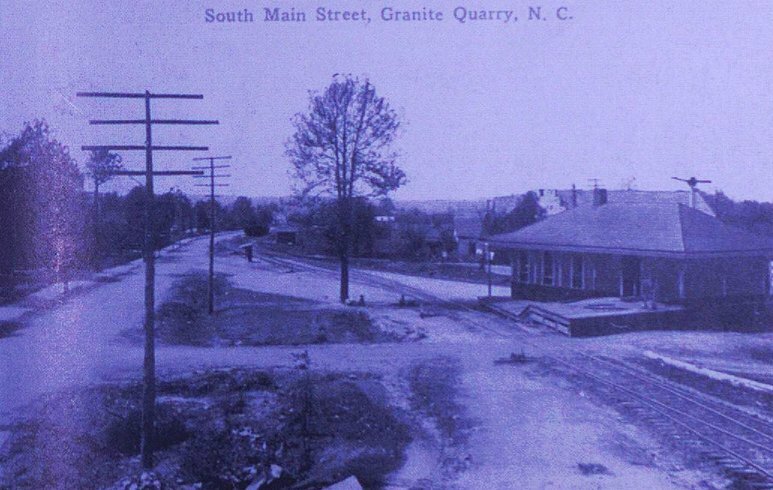 The coming of the automobile and paved roads during the 1920s offered Granite Quarry a new lease on life. Crushed rock was now in demand for the building of roads and the Yadkin Railroad hauled carloads of it both north and south along the route. Locally, the construction of US Highway 52 facilitated the use of rock from the quarries of which was hauled by rail. Other uses increased demand from the quarries as well. New construction using decorative stone and block actually created record volumes of production which would remain consistent until the years following World War II. Today Granite Quarry is a residential community with small businesses. Its reliance on the granite mining and railroad has long since vanished with the train merely passing through for other destinations. The depot still exists but not trackside within the town---it was moved to Dan Nicholas Park east of Spencer years ago where it currently still rests. Just south of town, traces remain of the branch line right of way that ran to Balfour Quarry. The Ford pickup and Mustang time stamp this scanned image of the Rockwell depot to the 1960s. It remained in use by the Southern Railway until 1975 as an office and storage. Just as in the case of Granite Quarry, this structure was removed from the railroad and moved elsewhere. Image courtesy Rowan County Library. 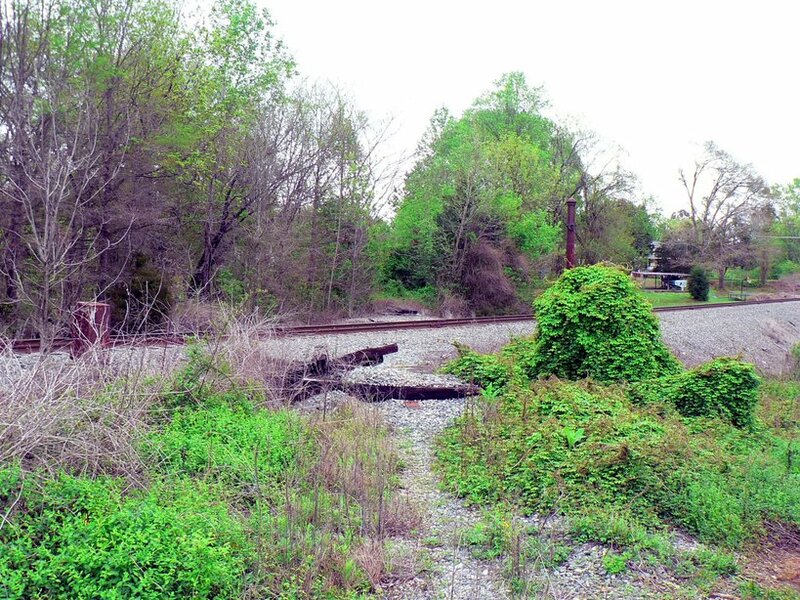 ICC archives list a derailment between Granite Quarry and Rockwell that occurred at noon on the afternoon of July 13, 1950 that resulted in four fatalities and one serious injury. Extra 585-661 was traveling southbound with nine cars and a caboose at 25 MPH when it derailed at a grade crossing 2.8 miles south of Granite Quarry. 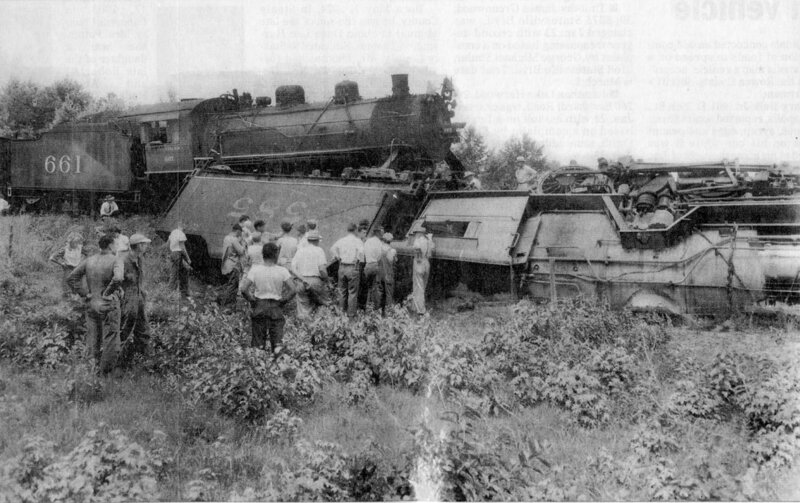 The accident caused locomotives # 585 and #661, both 2-8-0 Consolidations, the first two cars and the lead truck of the third car to derail at the scene with the lead locomotive and tender toppling over an embankment. Four crewmen were killed consisting of the engineer, conductor, front brakeman, and flagman. The only survivor was the fireman but he sustained serious injury. The history of Rockwell pertaining to the railroad itself in fact begins with the town name. 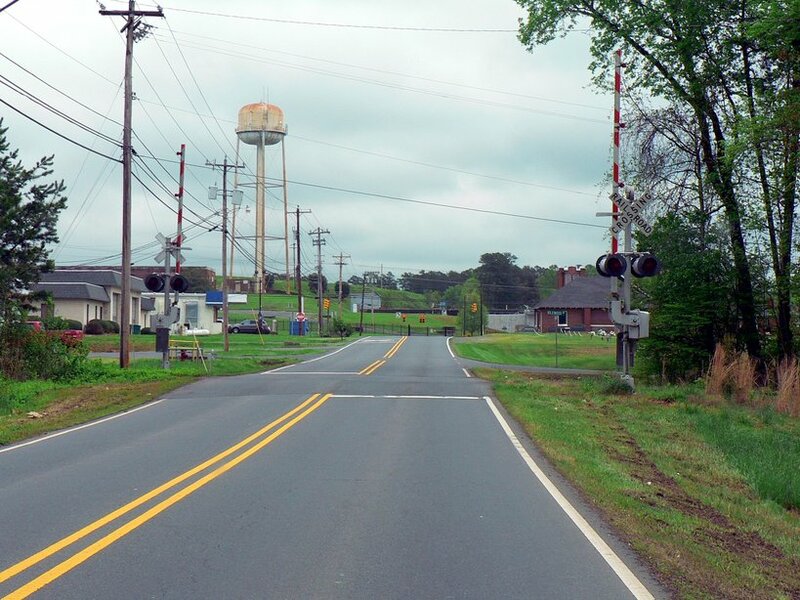 It is recorded that when the Yadkin Railroad was under construction through the community, railroad officials asked the towns people if the name could be changed because it duplicated another railroad location. The concern was the confusion and misrouting of mail and freight. All attempts to change the name were to no avail, however, as the people of Rockwell opted to retain the name. With respect to its prominence along the railroad in earlier times, Rockwell was basically a residential community founded by German immigrants with smaller shops and businesses. In this vein, it was not as commercially important to the railroad as some other towns along the route although as a passenger stop it was no less. 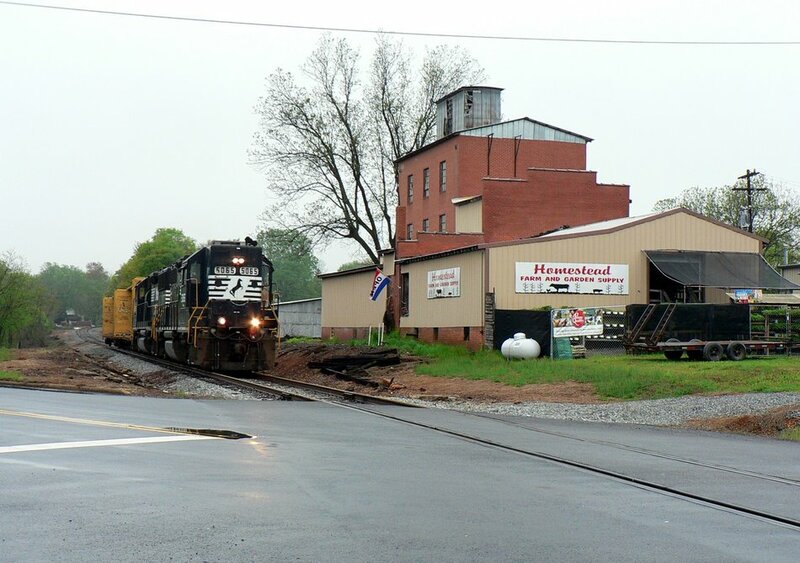 The railroad scene today at Rockwell consists of two shippers--one directly in town (Cozart Lumber) and to the south between the town and Gold Hill. 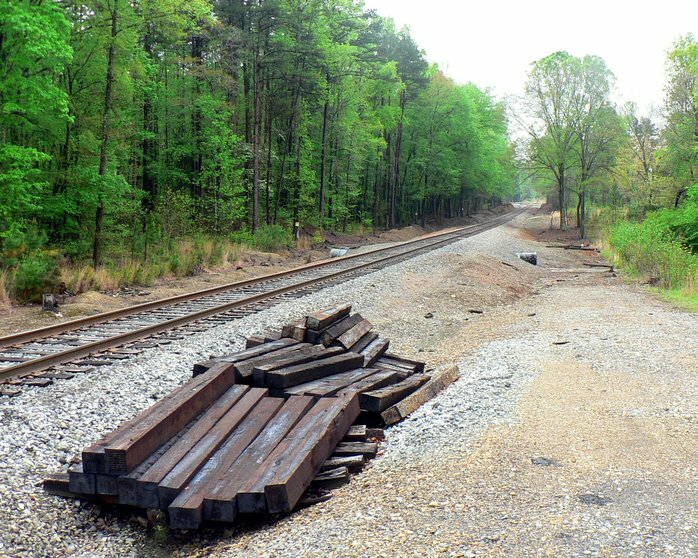 Located at the Zion Church Road grade crossing is the Edwards Timber Company which receivers center beam cars for lumber loads. In the town of Rockwell, the passing siding has been used for car storage of various types throughout recent years. The daily life of Gold Hill was interrupted on July 23, 1930 when southbound train Extra 392-401 derailed in the vicinity of the Gold Hill depot resulting in the death of one crewman and four injuries. This train consisted of thirty-nine empty refrigerator cars moving to Norwood as a return from one of the northbound seasonal “Peach Trains”. Extra 392-401 departed Salisbury at 840 PM and as it neared Gold Hill it was apparent that there had been heavy rain. No changes in operational characteristics were observed or noticed by crew but as the train approached the passing track at Gold Hill at 25 MPH, the pilot trucks on locomotive #392 rode the rail following the diverging route to the siding. The locomotive derailed and remained upright but the trailing engine #401 toppled on its left side opposite the #392. Both tenders were destroyed and the first four cars derailed scattering to various locations. The fifth car was partially derailed but the remainder of the train remained on the track. 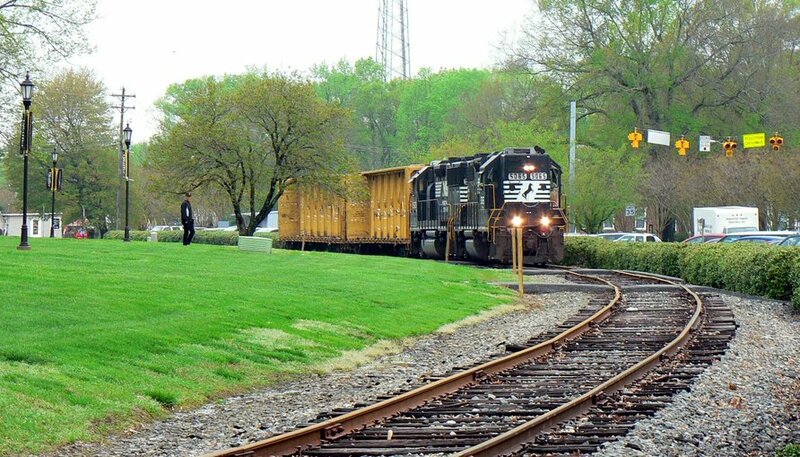 Investigation determined that the derailment was initially caused two miles prior to Gold Hill at a grade crossing. The heavy rains caused a buildup of dirt above the rail head causing the pilot wheels to leave the rails. Inexplicably, the lead locomotive continued to move along the track for two miles before derailing completely. The present day location for the initial cause for this derailment is the Johnson Dairy Road grade crossing. This 1908 Pratt map offers a layout of the mining that occurred in the Gold Hill region at the turn of the century. 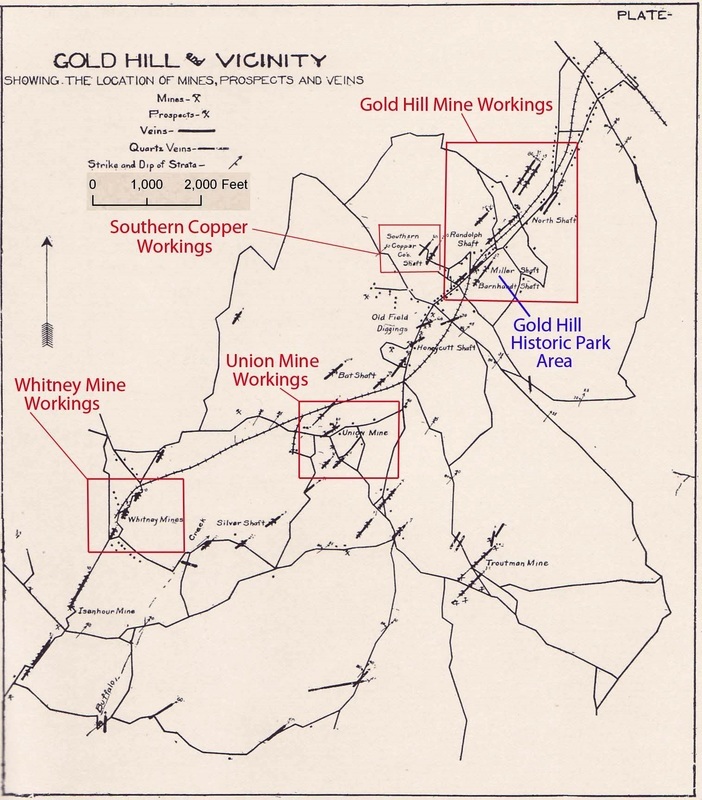 The primary mines are noted and as the map outlines, the Yadkin Railroad ran past it and the mining region served by a rail spur. Image Rocks of North Carolina page. The subject of gold, silver, and copper mining is immediately associated with the American West in states such as California, Nevada, and Utah. Any inclusion of North Carolina to the list would surprise all but the residents of the region and students of metallurgy. But the Tar Heel State is a study in early mining of precious metals and in fact, the discovery of these riches in the state predates the westward migration of American settlers to the west by several decades. 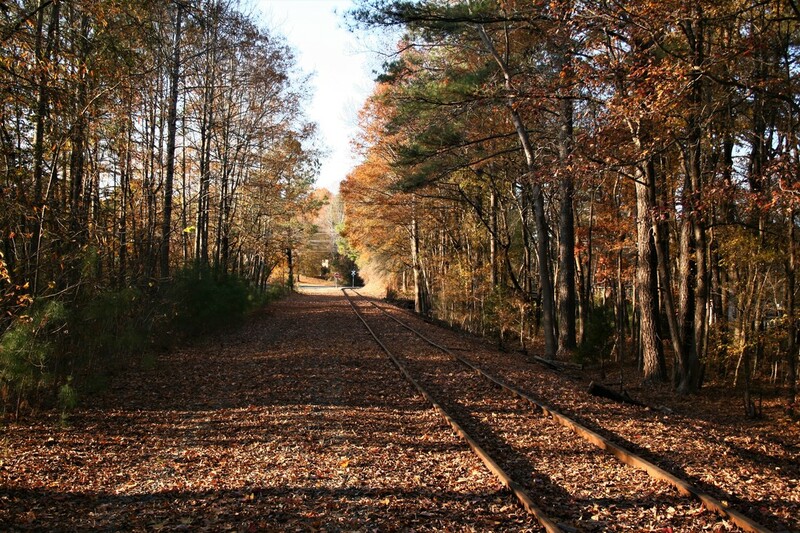 By the time the Yadkin Railroad was completed through the area in 1891, the heyday of mining at Gold Hill had passed. Some activity persisted, though, into the early 1900s and copper mining lasted until 1907. 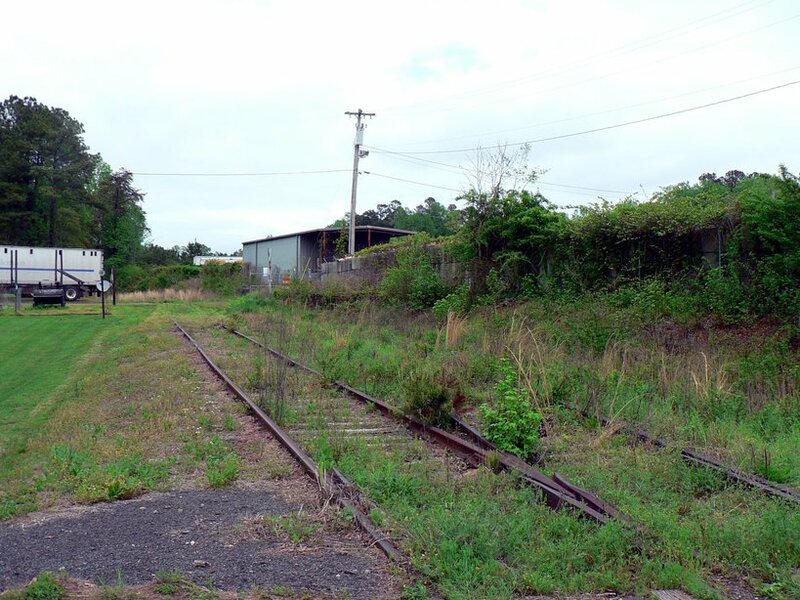 A rail spur passed through the Gold Hill region that connected with the Yadkin Railroad suggesting that it did play a role in the mining taking place. The transport of ore and equipment associated with mining was hauled if not at least in limited quantity. Gold Hill is a fascinating location in mining and North Carolina history beyond the scope of this page so for any reader interested in learning more about this aspect, click here. 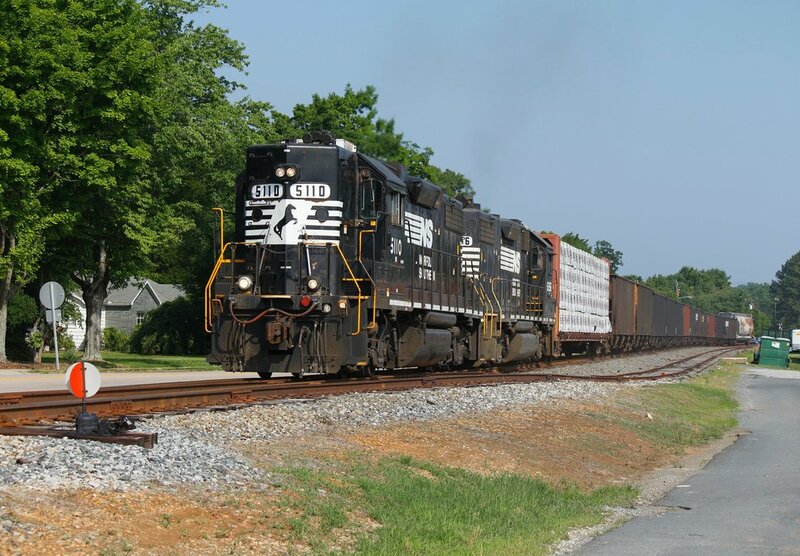 Modern times have witnessed the development of other rail shippers along the Yadkin line near Gold Hill. Two perlite plants exist along the line south of town but have seen a sporadic number of railcars in recent years. 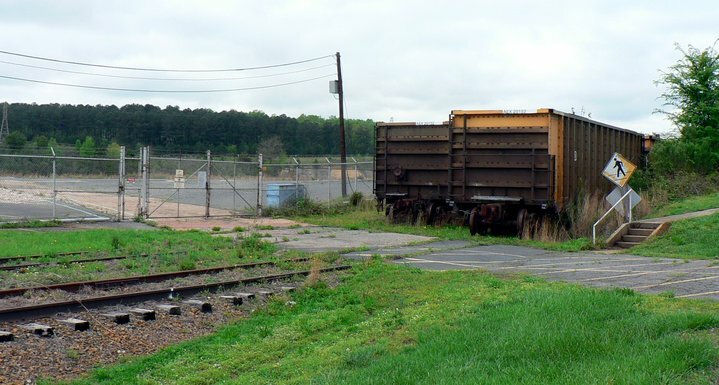 Further south and located on a long siding from the main is the Carolina Stalite plant which is actually located on Old Beatties Ford Road. A number of hoppers can be seen here for loadout---this may be the largest shipper on the Yadkin line today in terms or carloads and volume. 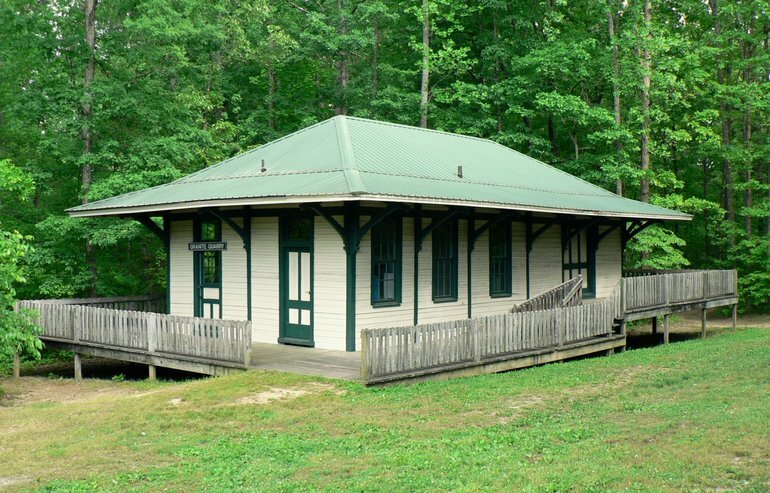 Originally known as Gladstone, this community located on a spur of the Yadkin Railroad was a destination for tourists during the late 1800s to Misenheimer Springs. Earlier history records the existence of the Barringer Gold Mine which first began operations in 1825 predating the gold mining in nearby Gold Hill. In 1909, the town officially changed its name to Misenheimer to correspond with the nearby Misenheimer Springs. Also in 1909 was the founding of the Mitchell Home School and the town has been known primarily as an education ever since. Today, the Pfeiffer University, evolved from the Mitchell Home, is the centerpiece of the community. Students at the school are treated to the daily passage of NS P92 for the railroad passes directly through the campus. No shippers remain at Misenheimer today although an old siding just north of the college still exists that once served one although no trace of the business remains. Richfield sprang from agricultural roots and during its early history of development, was diverse for a community of its size. 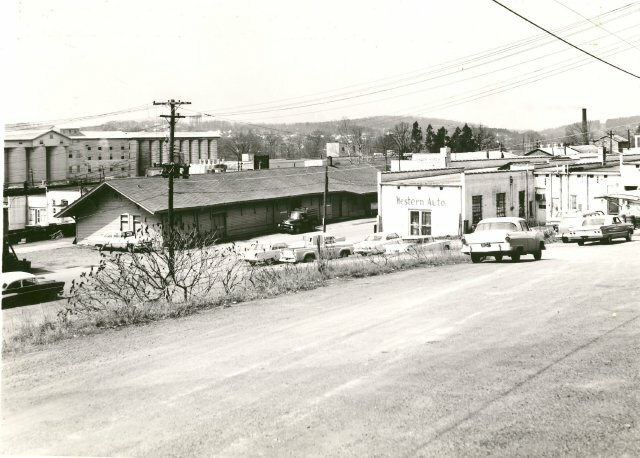 Listed in the town history are businesses such as lumber mill, steam roller mill, excelsior mill, and a shirt factory. The railroad played a role in these endeavors shipping raw and finished goods and passengers for Richfield was a stop along the route. With the passing of time, Richfield began a transformation into primarily a residential community. Many residents worked at other locations the railroad served such as Albemarle or Badin but elected to still reside here. 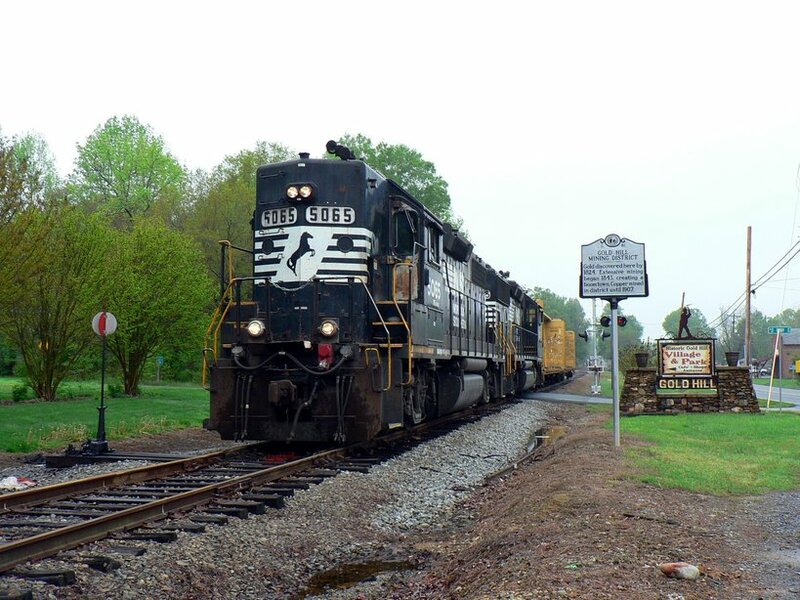 The town hosts one rail shipper today within its limits but mostly NS P92 merely passes through town to New London and the return to Salisbury. 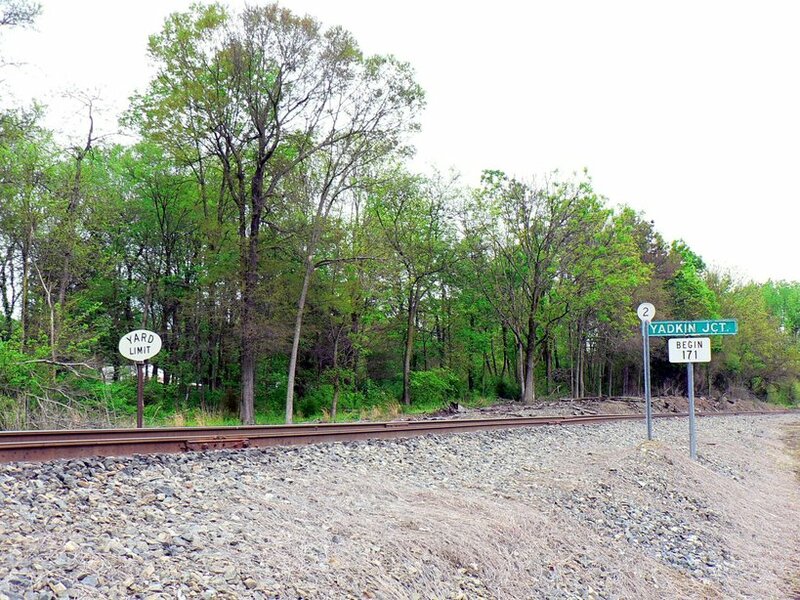 Traces of the railroad past are the abandoned passing siding and the location where the tiny depot was once situated. It remained trackside until 1998 when it was moved to another location by a private party. The old Richfield Mill building still stands as a symbol as an earlier time as well. New London, as one may surmise, has a direct English connection from its early history. From its beginnings in the 1870s originally founded as the town of Bilesville, had roots planted from the mining industry. Located in the same mineral field as neighboring Gold Hill, the precious metal was influential in the establishment of the town. During the antebellum period, the Parker Mine was opened and worked throughout the subsequent years. One individual associated with the mining, and English engineer, purportedly was influential in changing the town name in honor of his native city. The building of the Yadkin Railroad spurred small industrial growth within the area. 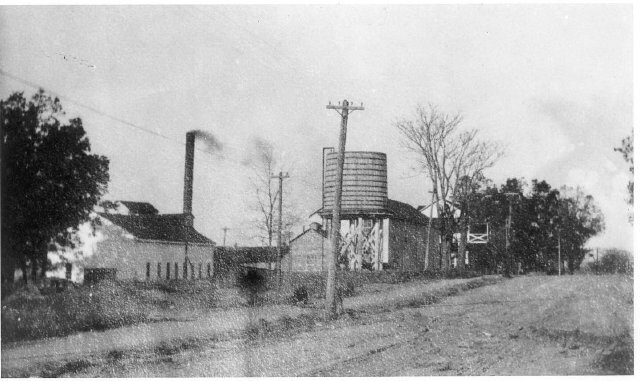 Small business such as saw mills, roller mills, bottling plants, and a foundry emerged further developing the area and creating revenue for the railroad. With the passing of the years, these smaller firms gradually disappeared from the landscape and were replaced with larger industries served by the railroad in the New London area. Although none are located in New London proper, active shippers remain just to the north near Richfield and south at Halls Ferry. 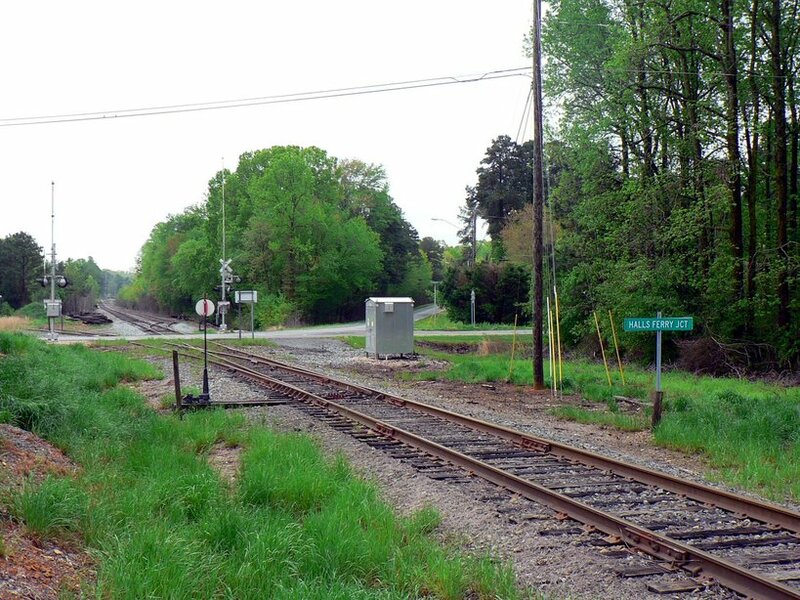 Located between New London and Albemarle, Halls Ferry Junction became a point where operations on the south end of the Yadkin Railroad split. The original line continued south from this location through Albemarle extending to the terminus at Norwood. Later, a diverging route forked from the main at Halls Ferry passing through Whitney before terminating at Badin. How this location received its name is a geographical misnomer because there is no stream crossing at this location. Solving this mystery would require an additional round of research. 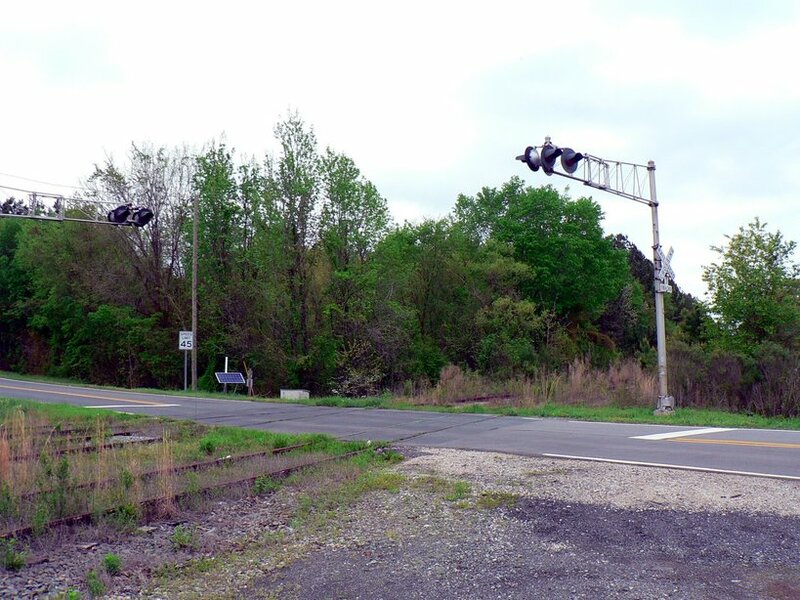 It was from this junction that the majority of traffic to and from Salisbury on the Yadkin line that carloads passed offering a diversity of freight. It consisted of loaded boxcars of textile material and hopper cars of coal for the mills of Albemarle and perishables in refrigerators cars from Norwood. In contrast, commodities of a different sort moving to Badin in support of the aluminum industry. The peak years were without question the 1920s when the Yadkin Railroad was active in its entirety. In addition to carloads of freight, passenger trains passed by the Halls Ferry junction making it a moderately busy location during that era..
Diverging tracks.....to the left, the line to Badin....to the right, the line to Albemarle. Dan Robie 2015. The abandonment of the Norwood section was the first instance of decline affecting the number of seasonal trains and general freight moving through the junction. Passenger trains had been gone for a decade by this date which had no additional effects. 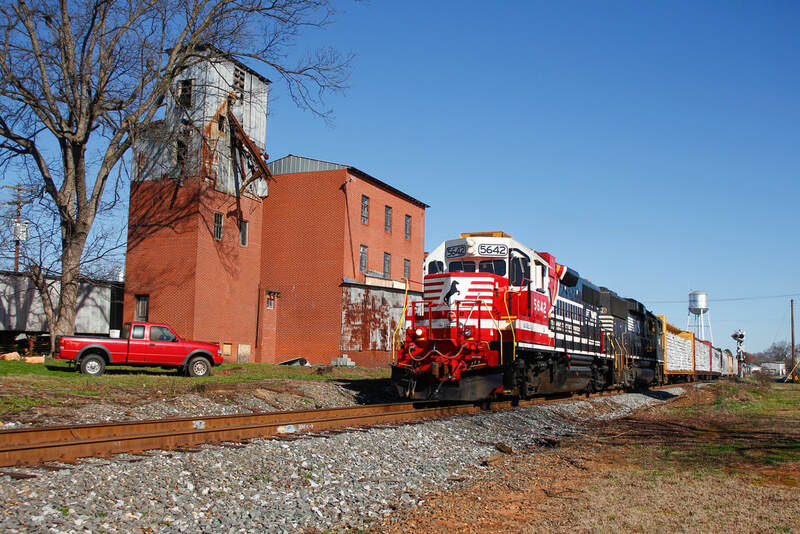 For the better part of fifty years carloads remained consistent with the mill traffic and small shippers in Albemarle along with ALCOA business. As the 21st century approached, storm clouds of economic change loomed on the horizon that would drastically impact traffic levels at Halls Ferry. 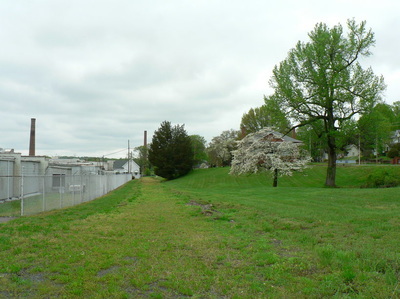 Once this storm passed with the resulting shutdowns of Wiscassett MIlls and ALCOA, Halls Ferry was transformed from a junction to an end point. Norfolk Southern business remaining today at Halls Ferry (New London) consists of two shippers that turn a respectable number of cars to and from Salisbury. Center beam cars are the mainstay at the Universal Forest Products Company and the southernmost shipper on the line, Southern Pipe, receives covered hoppers laden with plastic pellets. Without question, the most fascinating scenic aspect of the Yadkin Railroad is the eleven mile leased section from Halls Ferry to Badin. 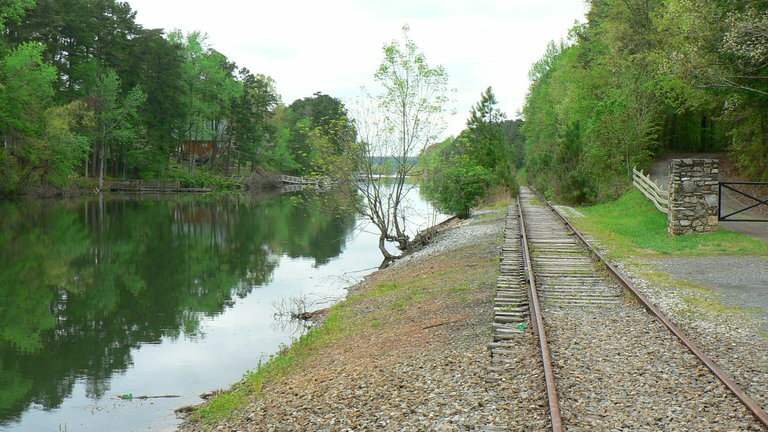 The railroad diverges at Halls Ferry and progresses through a densely populated wooded region before emerging at the shoreline of Badin Lake at Whitney. Here it crosses the Winston Salem Southbound Railway and runs on a causeway with the lake flanking it on both sides. It then touches the west shore of Graveyard Island then open water causeway again, then the west shore of Palmer Island before crossing the inlet to the west bank of the lake into the town of Badin. 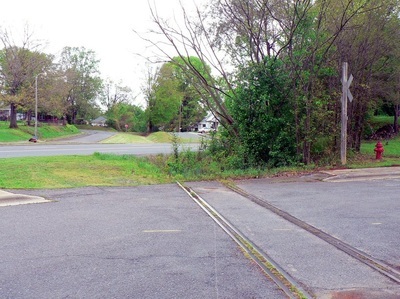 At Mile Post 4 is the remnant of the Yadkin Brick Company and the siding that served it. Located at Brickyard Road grade crossing. Dan Robie 2015. 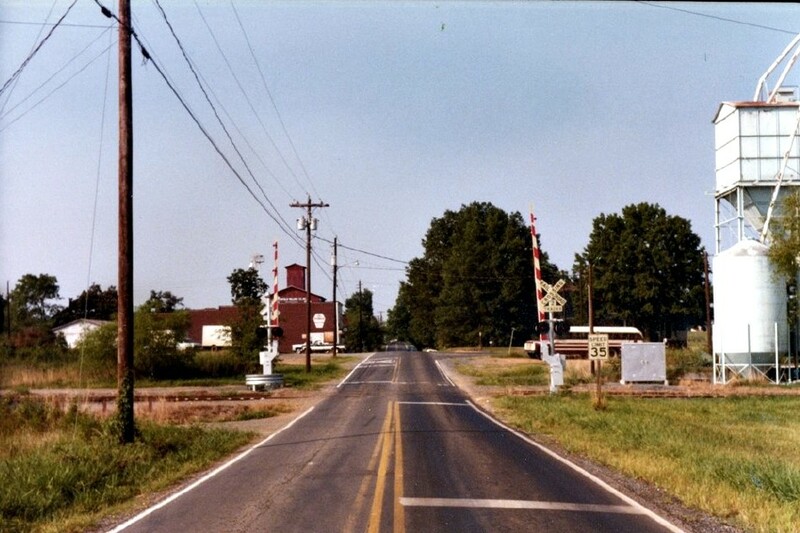 Originally settled as a farming community along the banks of the Yadkin River, Whitney, though small in size, would develop into a focal point as a railroad junction and as harbinger of expansion elsewhere in the region. The winds of change blew upon the area with the ambitions of two men seeking to construct a dam on the river for hydroelectric uses, financier George I. Whitney and visionary Egbert B.C. Hambley. The plan was undertaken in 1899 to build a 30 foot high dam on the Yadkin River at Whitney to furnish electricity for regional industry. These dreams never fully materialized as the Whitney Company was bankrupt by 1907 with all assets falling into receivership. (Subsequent developments will appear in the Badin section). 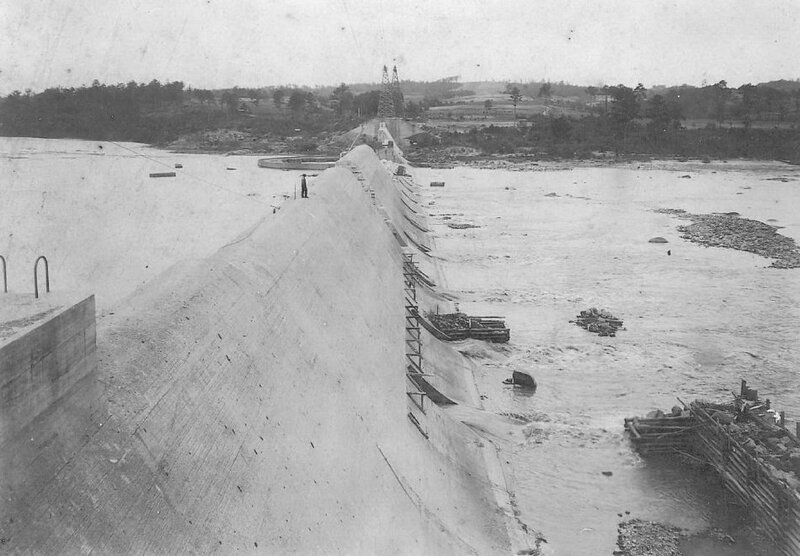 Early construction of the Yadkin River dam at Whitney in 1906 and the extent of which it was completed at right when the Whitney Company ceased construction by 1907. The Whitney Dam project was ultimately halted and a new dam was constructed downstream at the Narrows which submerged the original 30 foot high dam beneath the waters of Badin Lake. Images courtesy of Stanley County Museum. In 1910, the Winston Salem Southbound Railway was completed providing passenger service at Whitney between Winston Salem and Wadesboro. 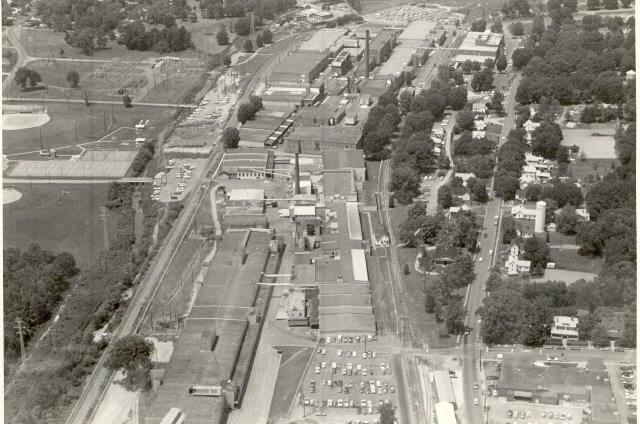 When the Southern Aluminum Company was constructed at Badin in 1916, track built and owned by the company between Whitney and Badin was leased to both the Yadkin Railroad and the Winston Salem Southbound (WSSB) to serve both the aluminum plant and the community of Badin. The section between Halls Ferry and Whitney was exclusively Yadkin Railroad and later Southern Railway. During the golden years of passenger travel extending into the 1920s, Whitney was a busy junction. 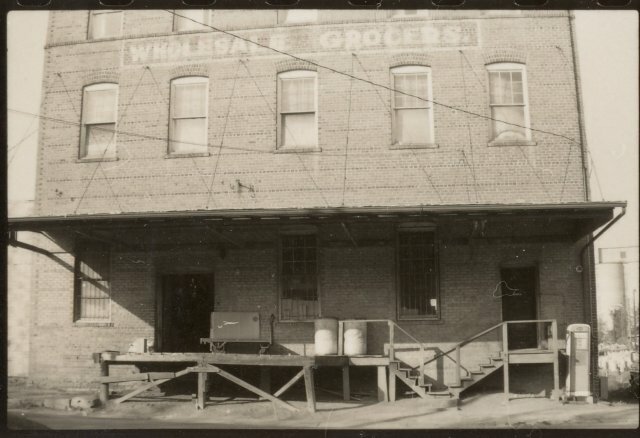 Eight passenger trains of the WSSB passed through daily and freight from both it and the Yadkin used the branch to service the aluminum plant and general freight. By the 1930s, passenger trains were a memory but the junction continued to witness trains with carloads of raw goods to Badin and the return of the finished product. This pattern would continue until the 1990s when the aluminum industry declined because of costs and market gluts. Reductions in traffic moving through Whitney became apparent with the closing of the Alcoa Aluminum plant in 2006. This scene chronologically precedes the others above at Whitney of the Coastal Carolina Railway moving hoppers from storage at the Alcoa plant at Badin. Location is on a causeway between Palmerville and Whitney and this wonderful image literally reflects the beauty of the railroad along Badin Lake. Image courtesy Matt Robie 2010. Whitney today is the domain of the fisherman. The shores of Badin Lake are populated with anglers that now witness the passage of two daily WSSB trains and a connecting branch to Badin that is silent. Only rare car storage movements traverse this piece of railroad now. Generally speaking, a community is established based on proximity to a stream or perhaps mineral resources within the earth. Beginning with the Industrial Revolution, towns sprouted like mushrooms along the railroads during the era of great expansion developing into centers of commerce of varying sizes. Others such as Badin owe origins to the development of an ambitious dream. Build a large manufacturing plant while harnessing the waters of a river and the town will follow. Continuing with the concept of a dream, the creation of Badin was a fulfilled one built upon the lost hopes of a shattered one. After the 1907 bankruptcy of the Whitney Company from the construction of the dam at Whitney, a four year period of dormancy followed with no other progress. It was in 1911 when a French engineer, Adrien Badin, was informed of the Whitney holdings by Jean Jacquett who traveled from France to research the details of the receivership. The following year Adrien Badin created the Southern Aluminum Company (L’ Aluminum Francais) and absorbed the former Whitney assets. Realizing that larger capacities for hydroelectric power would be required, the previously built Whitney Dam was considered insufficient and plans were developed for a larger dam located at the Narrows of the Yadkin River. 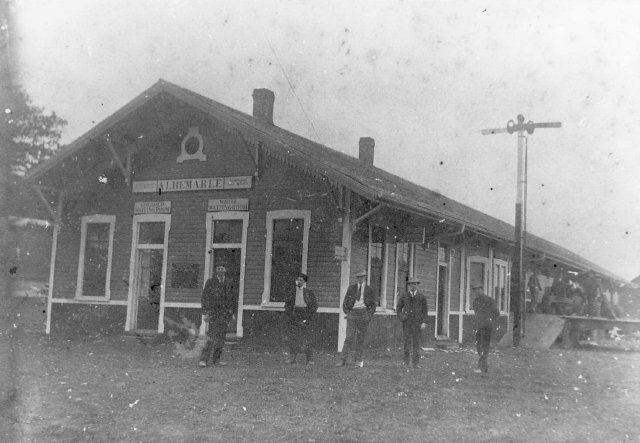 The Badin depot as it appeared during the 1920s. A brick structure of common depot design, it served passengers for both the Yadkin Railroad and Winston Salem Southbound Railway. 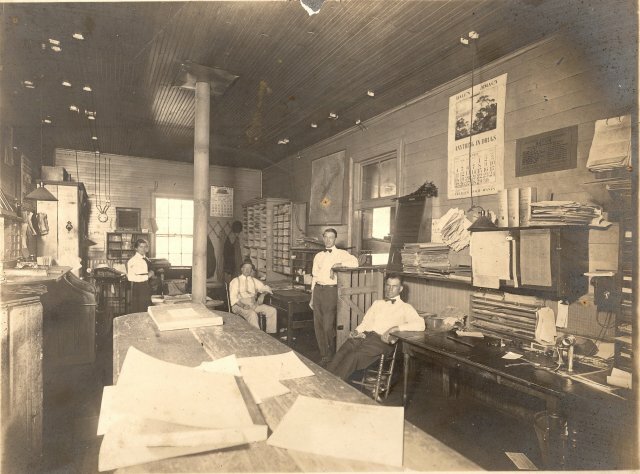 Image courtesy Stanly County Museum. In 1913, a community was formed near the site of the Narrows Dam and named Badin in honor of the Southern Aluminum Company president. The French influence was not only for the construction of the dam and aluminum plant----it was also reflected in the town architecture making Badin unique in this regard as well. Aluminum production in this era was a revolutionary development. With hydroelectric power for energy and a large industrial plant, this precious light weight yet strong metal could be manufactured in quantity and cost effectively. But history was to repeat itself. Just as the Whitney Company plans years earlier were not realized, the story of the French ambition to fully develop the area was thwarted by a conflict on the other side of the Atlantic. With the departure of the French interest due to World War I, The Aluminum Company of America (ALCOA) purchased the holdings of L’ Aluminum Francais and began manufacturing aluminum in its own right during 1916. For nearly a century henceforth, the plant would become the economic lifeblood of Badin and the surrounding region. The role the railroads played in the development of the region was significant. Track was laid to the Narrows Dam site to provide a method of transport for its construction. 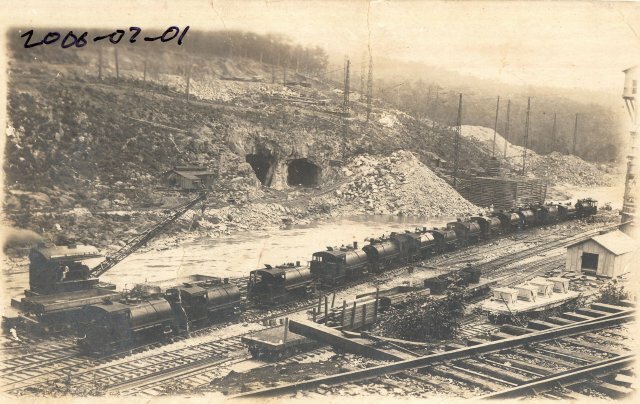 Carloads arriving via Whitney from both the Yadkin Railroad and Winston Salem Southbound Railway contained equipment, supplies, and materials for the building of both the Narrows dam and the aluminum plant. Traffic volumes in subsequent years would include the shipment of raw material (bauxite) to ALCOA and the return of the finished product. Salisbury became the rail gateway for ALCOA via the Yadkin Railroad and later Southern Railway for distribution over the vast rail network. Ultimately, the line from Halls Ferry to Badin would carry the greatest number of carloads superseding the remainder of the Yadkin line including Albemarle. Passenger rail disappeared quite early as compared with other regions. By 1930, trains over the Yadkin Railroad and the Winston Salem Southbound Railway were history having met their demise by virtue of the paved highways. Only a short segment from Halls Ferry to Badin continued to haul passengers on a on a regular basis but this, too, was discontinued within a few years. 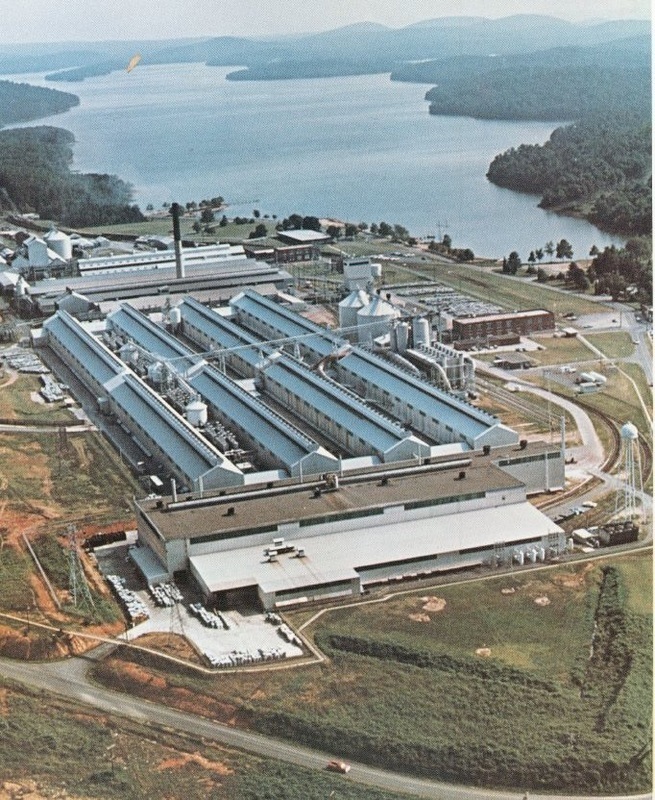 By the 1990s, industry trends spurred by international competition in the aluminum manufacturing industry began to adversely impact production at ALCOA. Added to this was the glut in the market, increased recycling, and associated costs for manufacturing. During this time period the last train to operate out of Badin, NS P91, continued to move cars to and from Badin to Halls Ferry. Ultimately, it was become prohibitive to compete in a market against these obstacles and in 2006, ALCOA closed its operation at Badin retaining only its power distribution market. 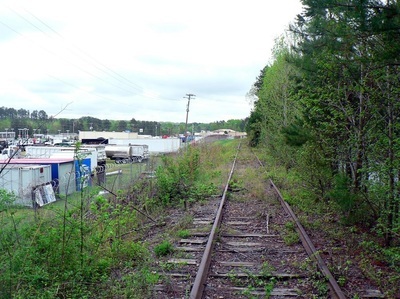 The closing of the plant effectively ended rail operations on the Yadkin Railroad from Halls Ferry to Badin (abolishment of P91) and today the line is overgrown and dilapidated. The Coastal Carolina Railroad was contracted to store and reposition hoppers from Badin to Whitney moving on the WSSB from there. These movements have been rare and as of this writing, none appear to have been made since 2010. 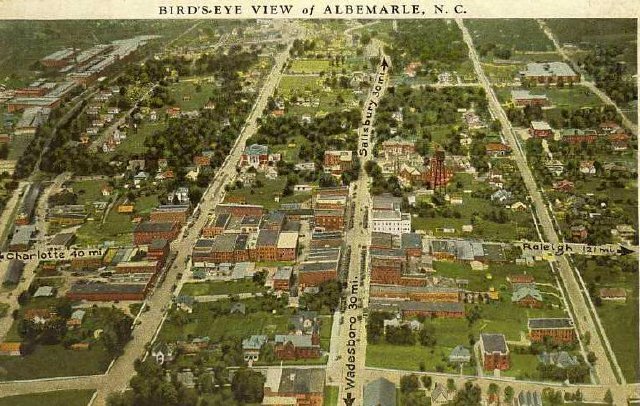 Picture postcard aerial view of Albemarle centered on the heart of the downtown looking north as it was in 1920. 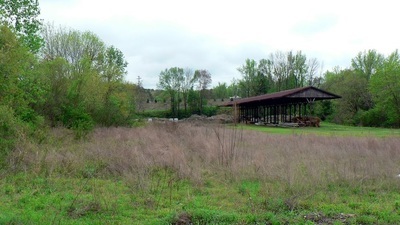 At extreme left the massive Wiscassett Mills is clearly visible and the Yadkin Railroad right of way can be followed to the depot area. At this date, the line continued south to Norwood. Image courtesy Stanly County Museum. The community that would become the county seat of Stanly County has its origins in a progressive manner that uncounted towns of comparable size do. It becomes a predominately agricultural region that eventually develops an industrial base whether by a large industry or a multitude of smaller firms. 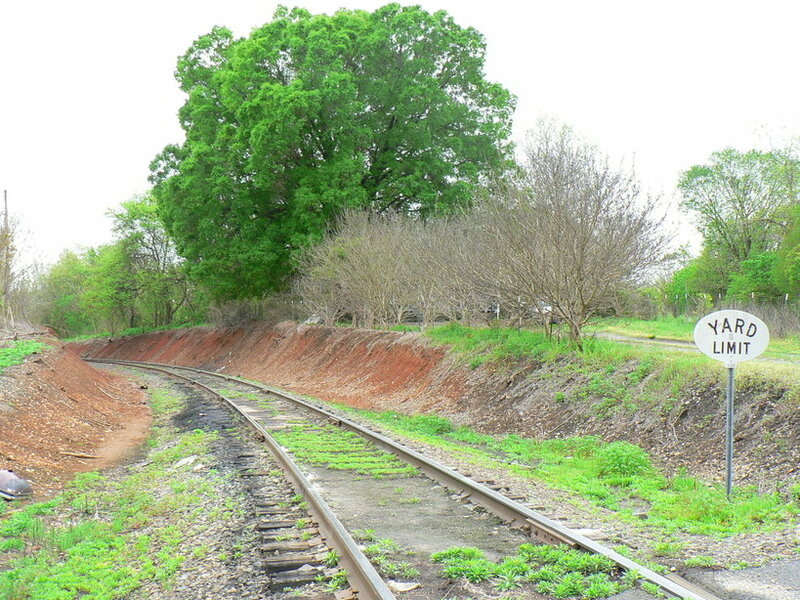 A catalyst such as the building of a railroad begins the transformation from agriculture to industry and in this case, the coming of the Yadkin Railroad did such beginning in 1891. 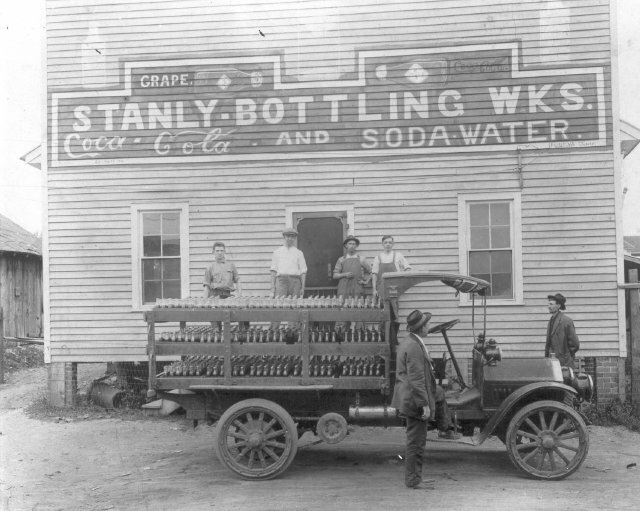 Small businesses like the Stanly Bottling Works in Albemarle flourished in the early 1900s. Today, images of them symbolize the charm and nostalgia of a simpler time. Image courtesy Stanly County Museum. Overhead view of the massive Wiscassett Mills operation as it appeared circa 1960s looking north. Flanked by the Winston Salem Southbound on the left and the Yadkin RR/Southern Railway on the right, it was served by both. For many years, the industrial and economic heart of Albemarle. 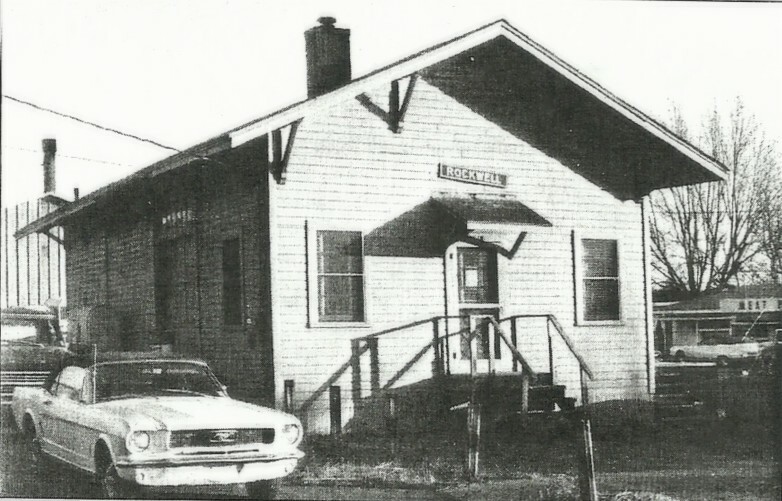 Image courtesy Stanley County Museum. This 1993 Google Earth view overlooks Wiscassett Mills in its twilight years. 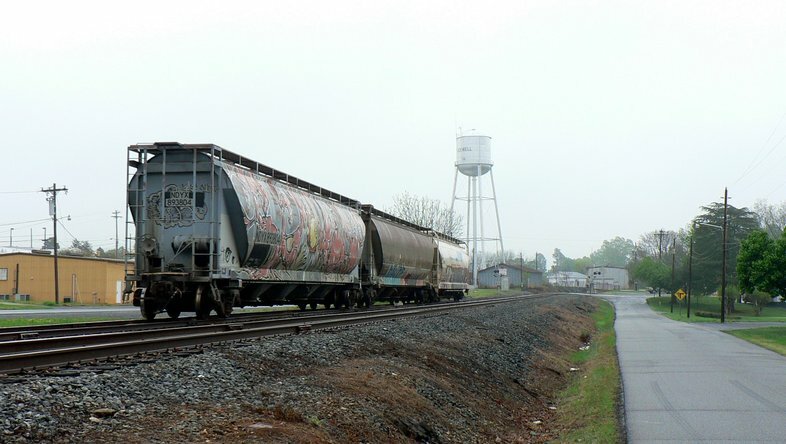 A few railcars are visible along the complex and the track is still intact further into downtown Albemarle. 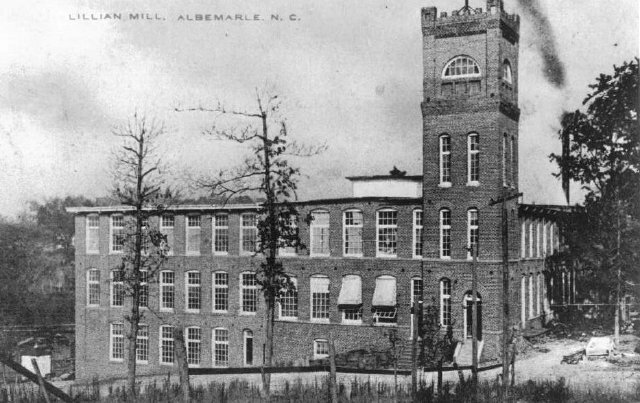 The late 1890s saw the industrialization of Albemarle in earnest. It was during this era that the textile industry spawned into a mammoth sector of North Carolina commerce that would remain in force for nearly a century. During 1898, Wiscassett Mills was founded and it was soon followed by Windemere Knitting Mills of which merged into the former in 1903. Lillian Knitting Mills opened for business in 1905 and during the following years, other small companies in cotton and textiles were founded. Supporting businesses to the textile industry were established and other commercial ventures dependent on that industry were also formed. 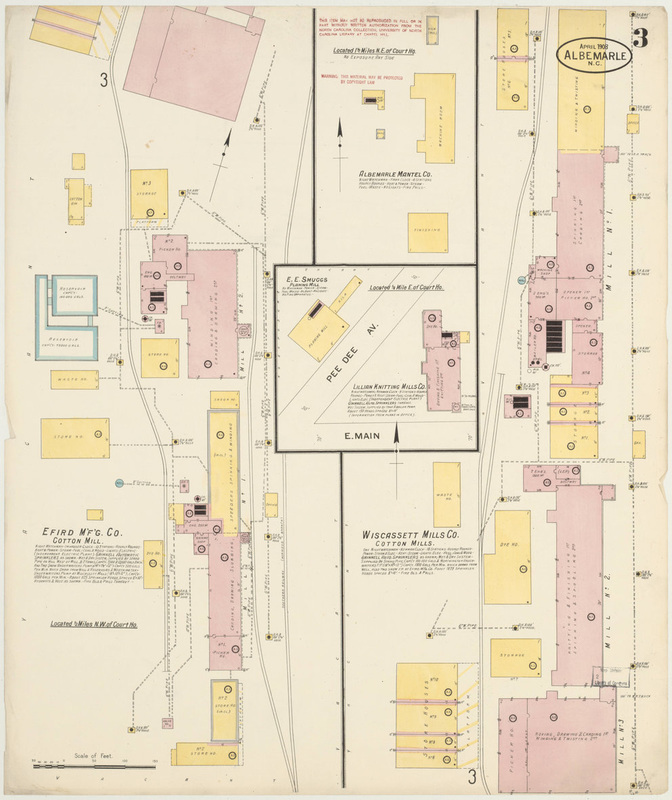 A circa 1913 Sanborn map that includes details of Wiscassett Mills, Efird Mills, and the Lillian Knitting Mills. 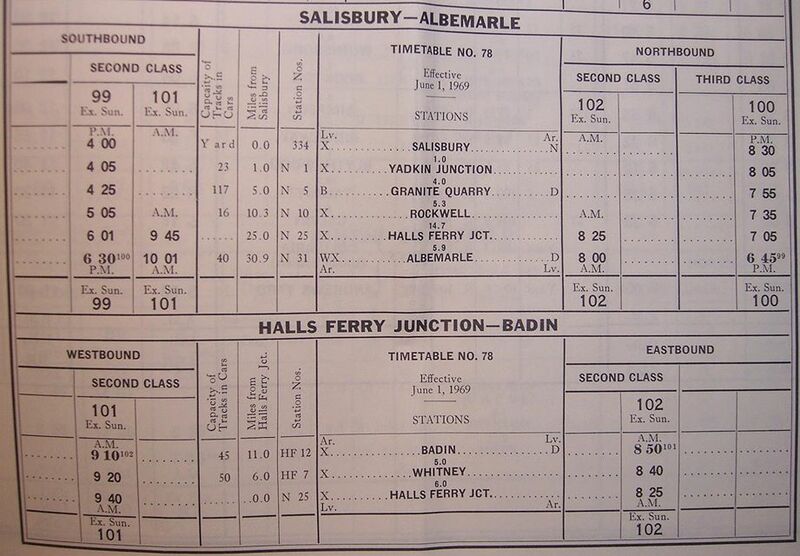 Albemarle was the primary passenger base for trains from Salisbury. As the largest population center on the route, it was also the major boarding location and destination point from areas such as Norwood and the communities to the north. After the Badin area was developed with ALCOA, Albemarle also received train shuttle traffic from that branch line serving Whitney and Badin. 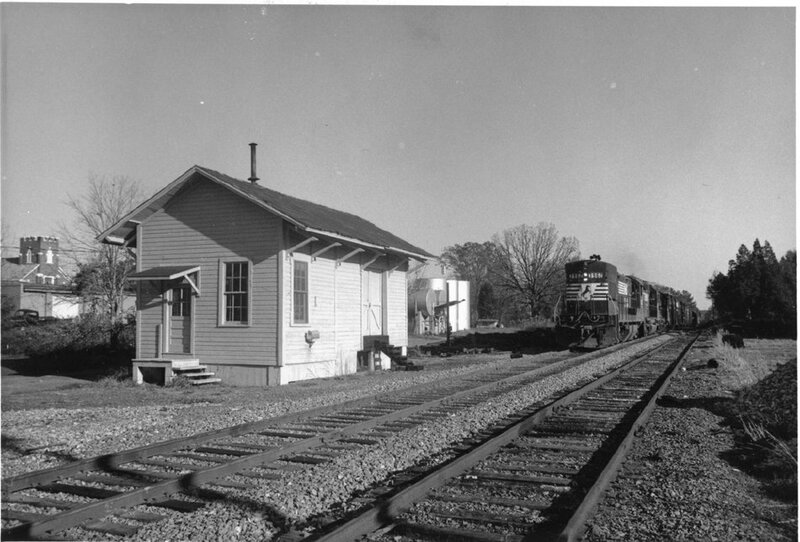 With the completion of US Highway 52, passenger trains met their demise by 1929 and Albemarle was strictly freight only from that period forward. 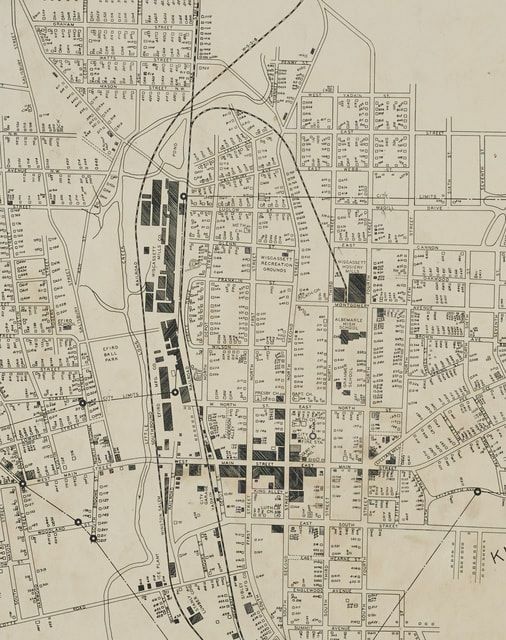 1922 map of the downtown area south of the depot. 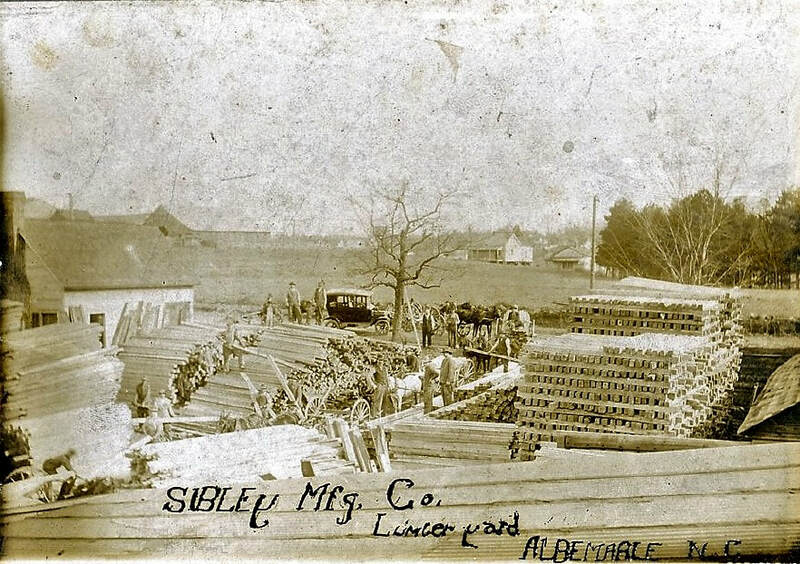 The Sibley Manufacturing Company was a prominent shipper during the early years of the railroad. 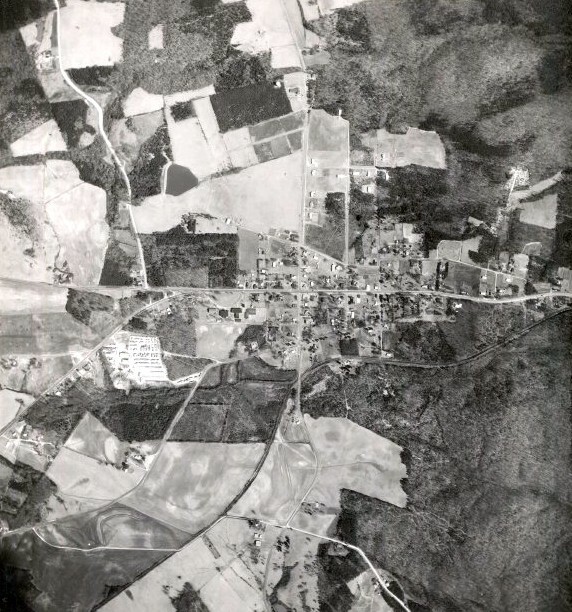 The center of downtown Albemarle as it was in 1922. Both the freight and passenger depots are indicated on this map. A significant change that affected Albemarle was during 1938 when the Yadkin line was abandoned to Norwood. 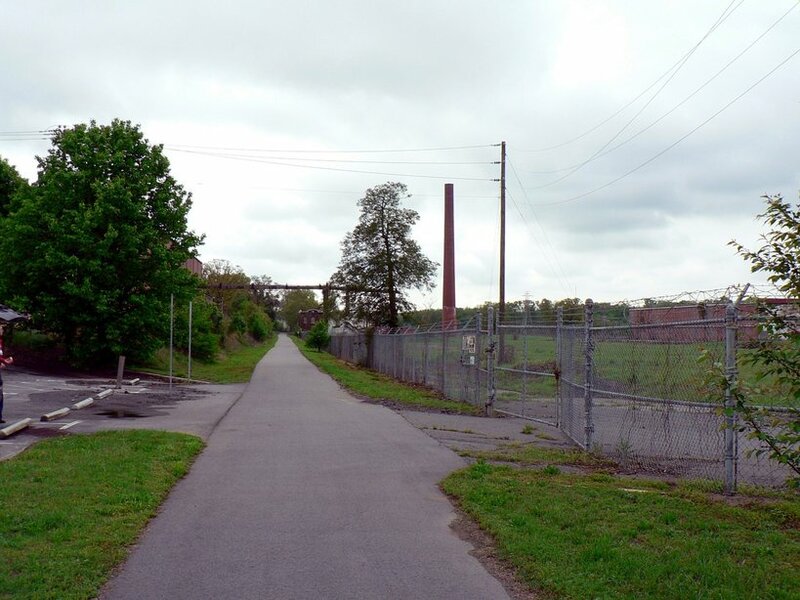 With the removal of this track, it became the terminating point on the route south from Halls Ferry. 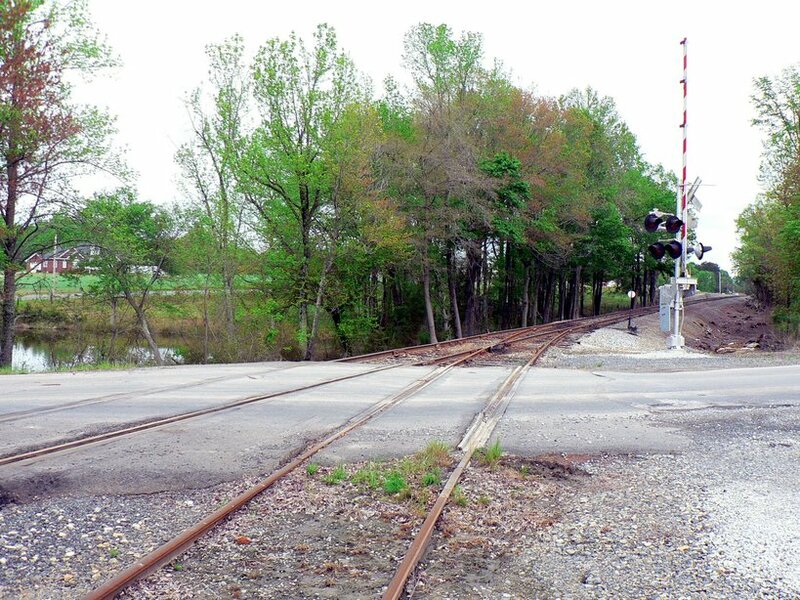 There was no longer any through freight passing through Albemarle and as a result, became a switching end point. Inbound traffic to the mills and depot area would be blocked for inbound and outbound carloads accordingly. 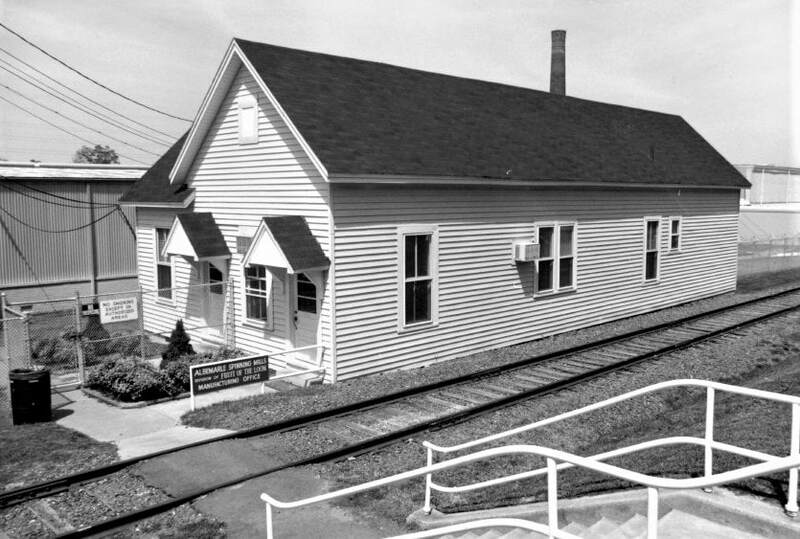 During the postwar era, Wiscassett Mills continued as a steady rail shipper for both the Southern Railway and WSSB. 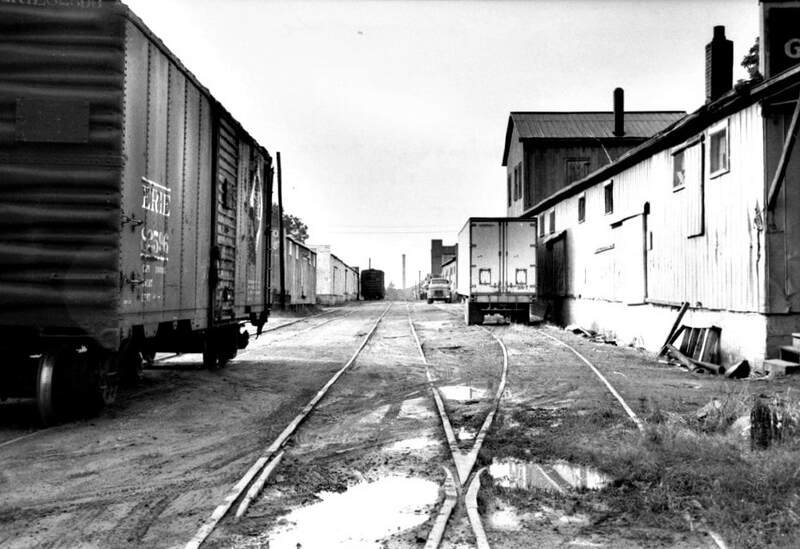 Smaller shippers within the city remained but with the passage of the years, began to vanish from the landscape by either going out of business or converting shipping to trucks. Textiles remained a mainstay in the local industry but by the 1990s, were clearly fading primarily due the cheaper cost of imports. 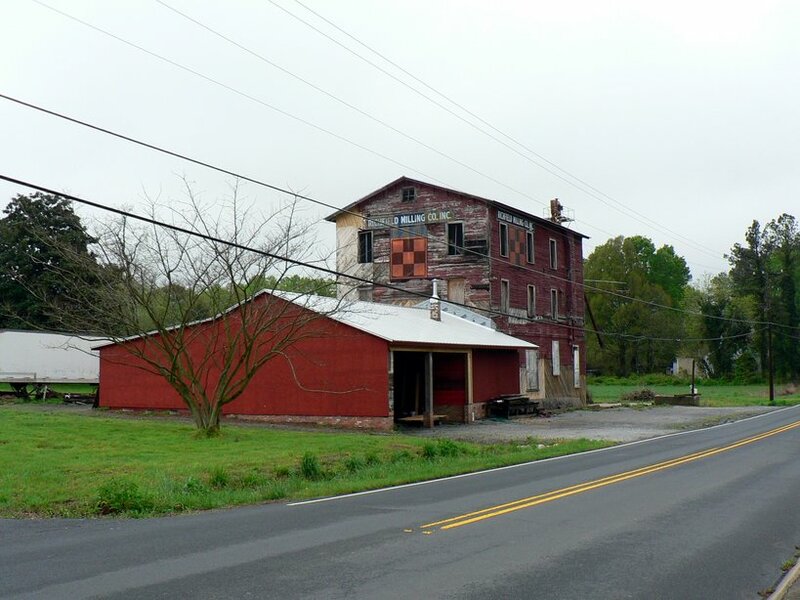 The inevitable occurred in 2000 when Wiscassett Mills shutdown resulting in the loss of jobs and effectively ending the presence of the Yadkin Railroad/Southern Railway in the city. Once Wiscassett Mills ended its final shift in 2000, the section of railroad from Halls Ferry to Albemarle was without a purpose. 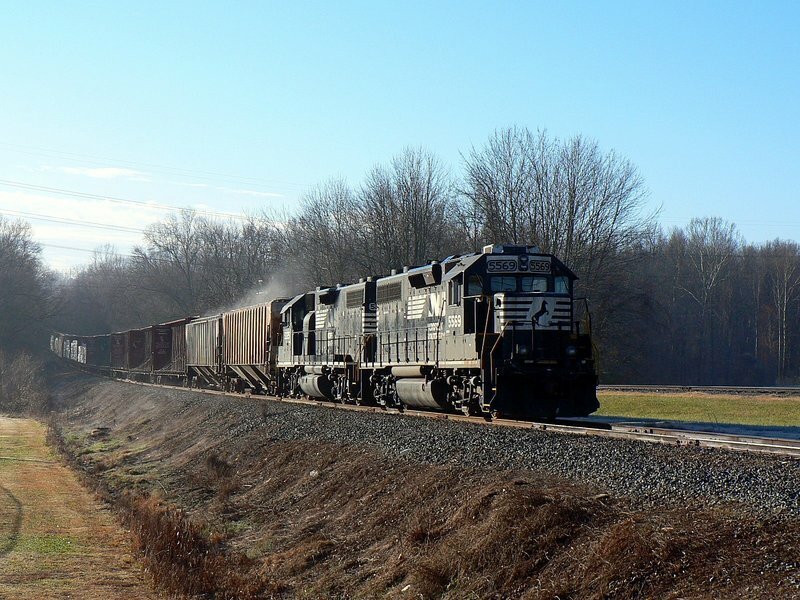 Other small shippers along the route had already evaporated and for the first time in more than a century, trains no longer ran into Albemarle on the Yadkin line. Track from where the line ended near Aquadale Street back to near US 52 was removed and another section from that area north to Halls Ferry remains in place but in dilapidated condition. The diamond where the Yadkin Railroad crossed the WSSB was removed and the right of way from the Little Long Creek bridge to Wiscassett Mills converted to a walking trail. A trek along this trail is interesting as one can envision the activity that once took place here. Of special interest is the trail to the Little Long Creek bridge which now has wood planking for hiking. A close examination here reveals the railroad right of way where it crossed the WSSB on a diamond. An old rusted signal mast still stands and the foundation of a WSSB tower is visible that once guarded the junction. Bullock Drive grade crossing--flashers still in place. Looking north across the WSSB where the Yadkin crossing and diamond was located. 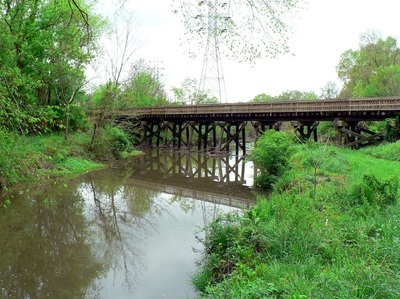 Yadkin RR bridge across Little Long Creek--part of walking trail. Former right of way at West North St--view looks north. South Albemarle: Where line ended once section to Norwood was cut. At the time of this writing (April 2015), it has been stated by a couple of local Norfolk Southern employees that the section of line from Halls Ferry to the location of the former Wiscassett Mills may be reopened. There are plans for an industrial park to be constructed and served by rail and rather than a siding added from the Winston Salem Southbound Railway, the old Yadkin Railroad route is the choice. If it indeed transpires, an update will be added to this page. It has been more than seventy-five years since the railroad from Albemarle to Norwood vanished from the scene. Along the route between the two towns, the right of way location is vague but a good reference is the Winston Salem Southbound Railway. In fact, the two lines once paralleled between the two points. No remnants of the railroad are still extant since it has been so long ago that it existed. The Great Depression hit Norwood especially hard and led to the quick demise of the Southern Railway to the town. Shippers vanished and the passenger base had moved to vehicular traffic on US Route 52 prior to the Stock Market Crash in 1929. Perhaps an ominous sign of the times ahead was the destruction of the Norwood depot by fire in 1929. Within a decade, traffic faded and in 1938, the railroad was abandoned between Albemarle and Norwood. Another factor to consider is that the two other railroads that served Norwood---the Winston Salem Southbound and the (original) Norfolk Southern---had a distinct advantage with passenger travel although service disappeared from them within a few years . Both were direct routes to larger areas such as Raleigh, Charlotte, and Winston-Salem whereas one had to travel to Salisbury on Southern rails then board connecting trains. The automobile and paved roads, however, rapidly shifted travelers from the rail to the concrete dooming passenger travel on all three. 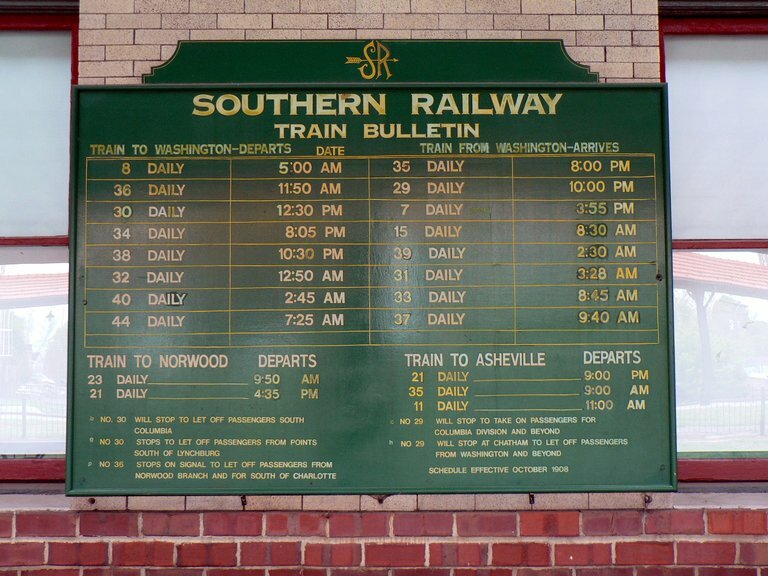 This 1908 Southern Railway timetable hangs on the Salisbury station wall at the outside concourse. Listing all trains of the day, of particular note here are the two trains running to Norwood. Train #23 was a morning run and Train #21 ran the Yadkin line in the afternoon. 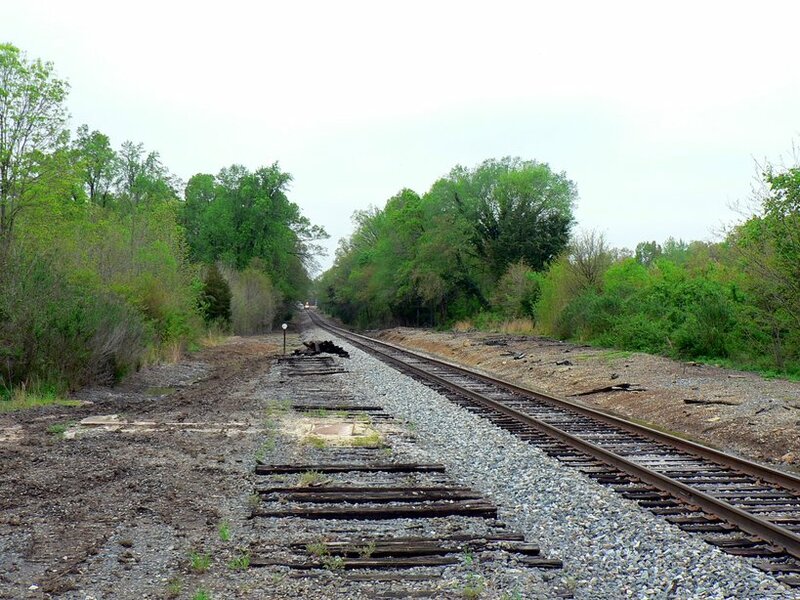 Included in the research of this railroad was a trip to search for any identifiable traces of right of way clearly discernable between Albemarle and Norwood. Almost eighty years since the line was abandoned, nature has reclaimed it and though there may be glimpses of it at different locations, it is not defined. One clear cut location is the Rock Creek Park south of Albemarle that actually utilizes a section of it. 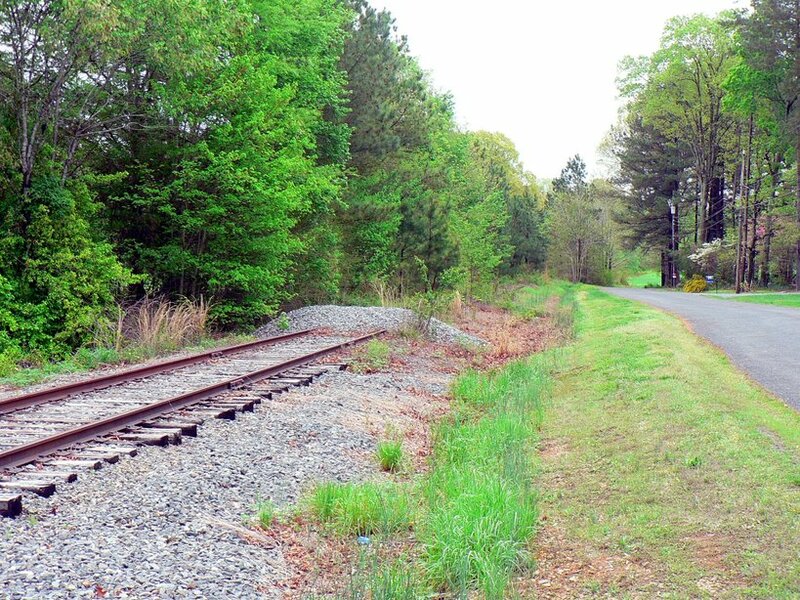 Trips off side roads between US 52 and the parallel running Winston Salem Southbound Railway were mostly in vain as the old Yadkin bed was not conclusively found. Only at the small community of Porter did I feel certain of seeing a small section of surviving roadbed. It does appear readable on Google Earth, however, at various locations. 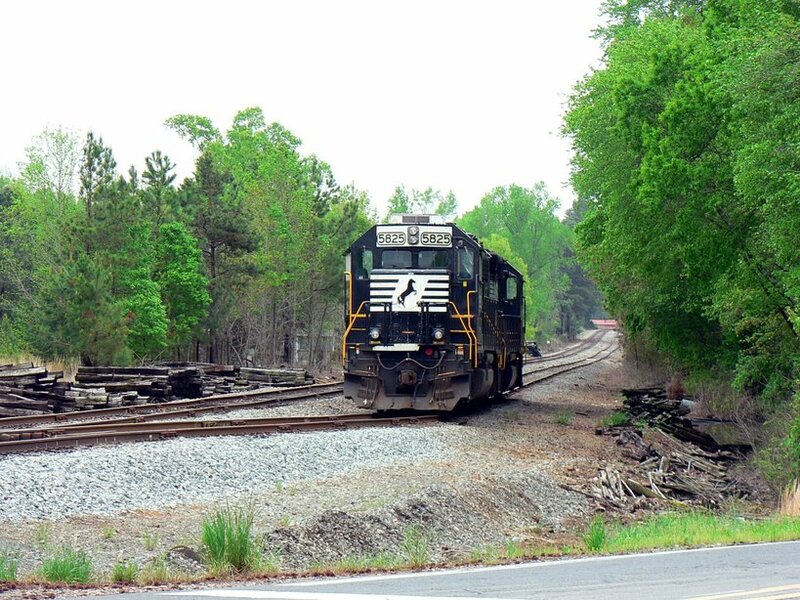 One other telltale location is the interchange track between the WSSB and the Aberdeen, Carolina & Western Railway ( ex- original Norfolk Southern Railway). This right of way coincides with the former Yadkin entrance into Norwood. This 1916 North Carolina Soil map is a rare glimpse of the Yadkin Railroad between Albemarle and Norwood. 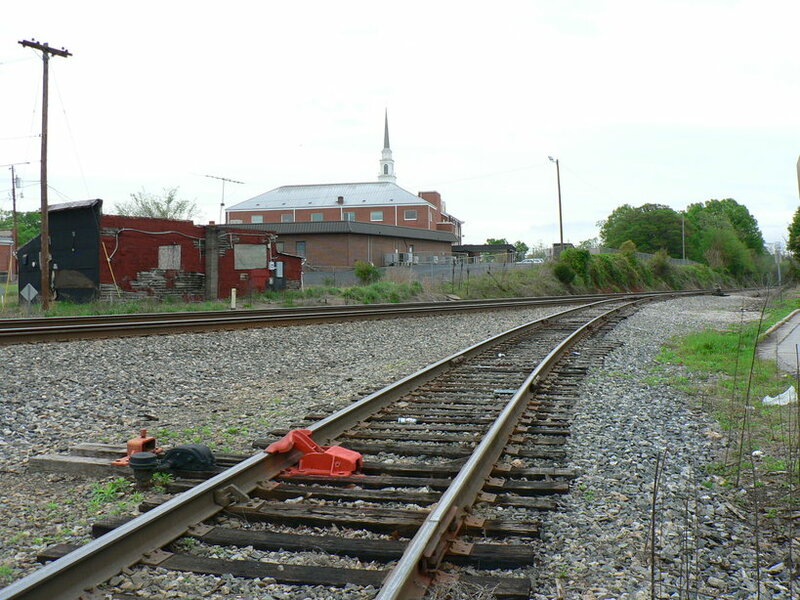 But for few locations, the railroad directly paralleled the line of the Winston Salem Southbound Railway. The redundancy was a contributing factor in its early demise. 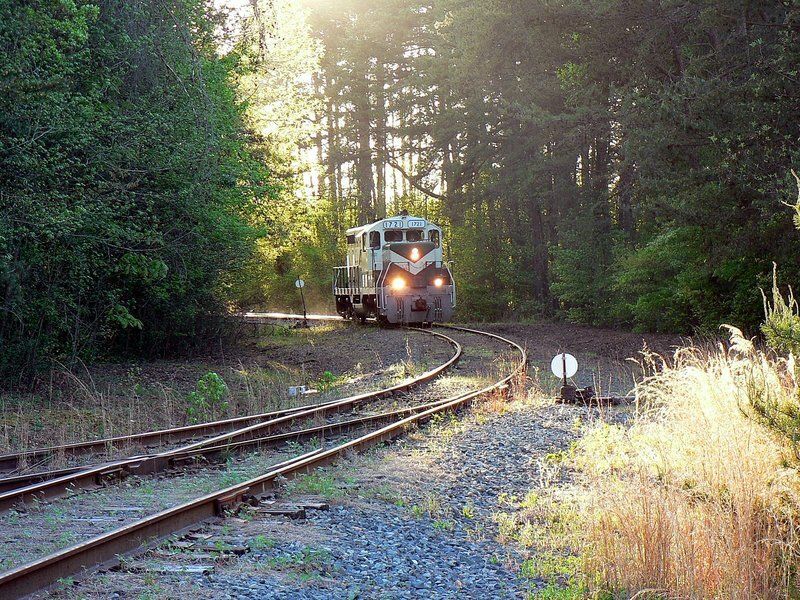 For the individual looking to spend a day of exploration, tracing the Yadkin Railroad offers an interesting outing. The small communities that dot the line reflect unique characteristics and histories widely diverse within a condensed region. Moreover this can be more than a railroad endeavor; optionally, an enjoyable family outing can be had on this trip culminating with time spent along the shores of Badin Lake. If one so desires, fishing poles can be packed along with the camera providing variety for the day. With regards to watching any rail activity, obviously a week day is in order. 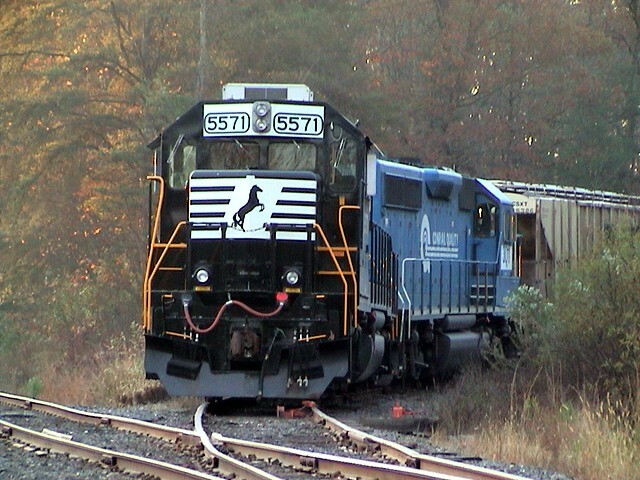 Norfolk Southern operates its local P92 between Salisbury and Halls Ferry during those days only. Obviously, it will be the single train on the line but will afford opportunities to photograph it at different locations thereby offering various settings.